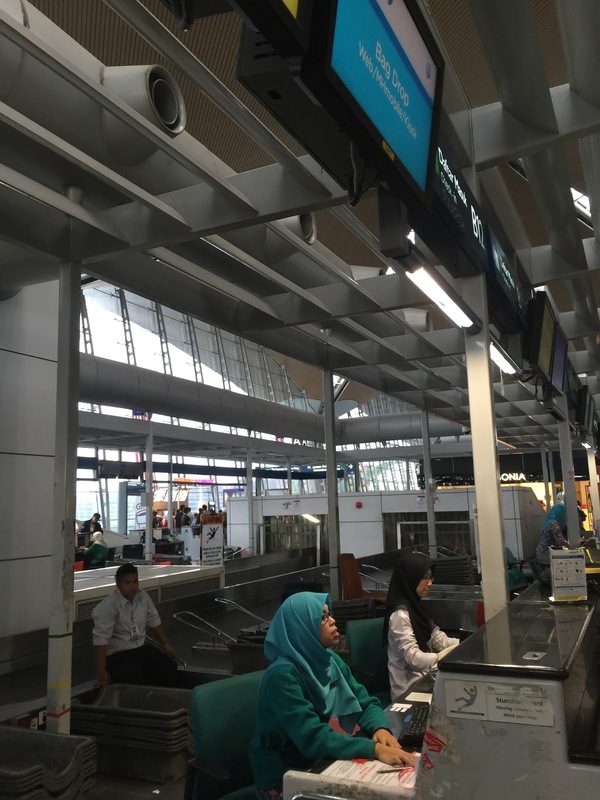 Malaysia Airlines check-in counters are located at Row C, on the right end in Bali Denpasar Airport. 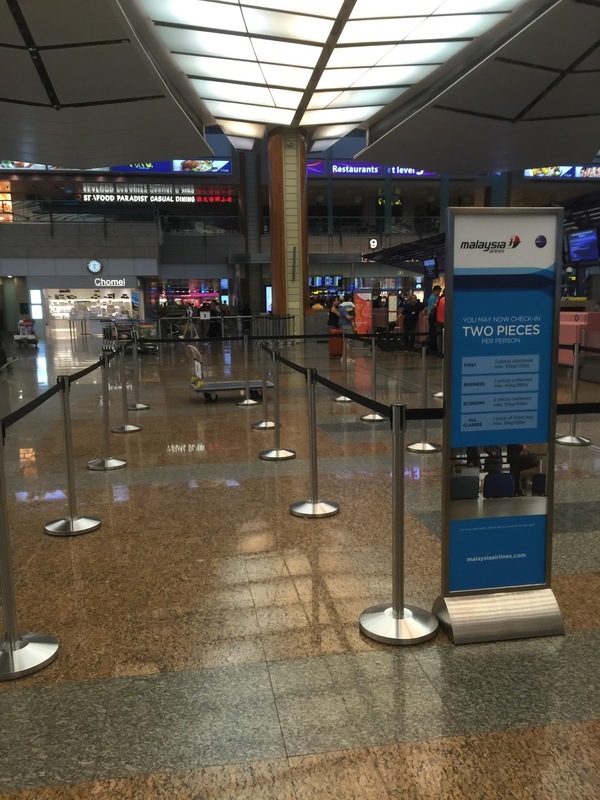 There are four counters used by Malaysia Airlines for passengers checking-in. Two counters are dedicated to passengers travelling in Economy Class cabin and one for Business Class passengers. 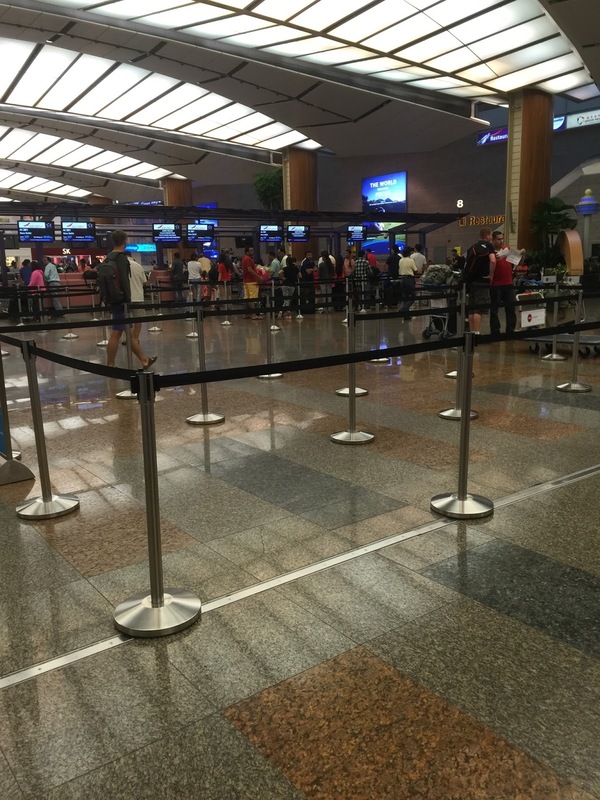 There is an additional counter for passengers who have oversize baggage to check-in. As we were at the airport a tad early, there are no queues at the Economy Class counters. 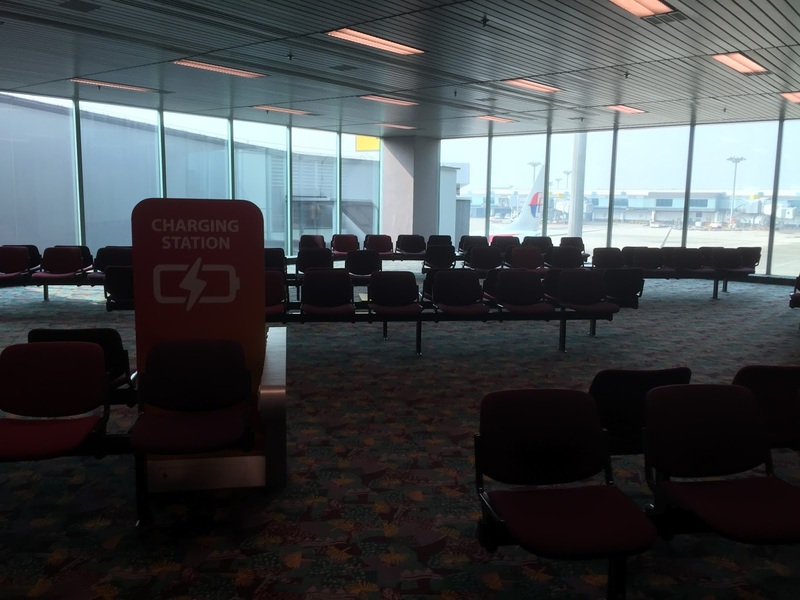 We were asked to check-in at the Business Class counter, which seem to be the only counter that is operating at the time we arrived at Bali Denpasar Airport. Check-in was done efficiently, the friendly ground staff quickly processed our check-in, took in our luggage and gave us instructions on which gate our flight will be departing. As the flight was delayed by 45 mins, which has an impact on our connecting flight to Singapore in Kuala Lumpur, when we raised our concerns to the ground staff, the ground staff assured us with a friendly and assuring tone of voice that we will still be in time to catch our onward flight to Singapore in Kuala Lumpur. Malaysia Airlines uses the wide body twin aisle A330-300 for this Bali to Kuala Lumpur flight. Malaysia Airlines A330-300 has a total of 290 seats spreading across Business and Economy Class cabins. There are a total of 27 seats in Business Class cabin and 263 seats in Economy Class cabin. The Economy Class cabin is further split into a three sections, with a small section of 16 seats located just behind Business Class cabin, isolated from the rest of the Economy Class cabin. This section is a lot quieter and offers a lot more privacy compared to the rest of the Economy Class cabin at the back of the plane. I managed to secure seats (for the six of us flying) in the small section of Economy Class seats through the Malaysia Airlines mobile app when performing online check-in. This section of the Economy Class cabin (rows 9 and 10) looks bright, thanks to the white walls and the use of white mood lighting during boarding. The choice of bright red colour for the seats also contributes to the clean and new look on board Malaysia Airlines A330-300. There are two lavatories behind the small section of Economy Class cabin, however only one of the lavatory can be used, the other lavatory is constantly kept locked by the flight attendants as it is reserved for Business Class passengers. 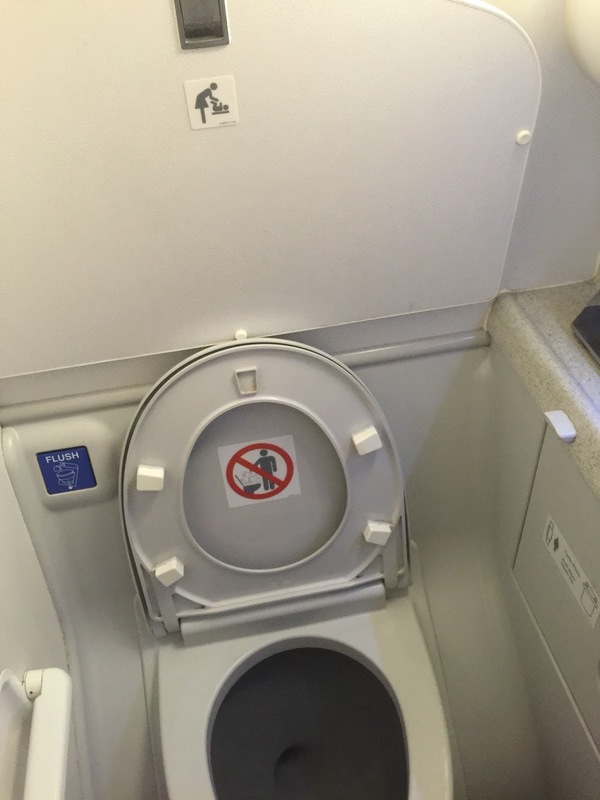 The lavatory on board Malaysia Airlines A330-300 is slightly larger than those found on board the B737-800. 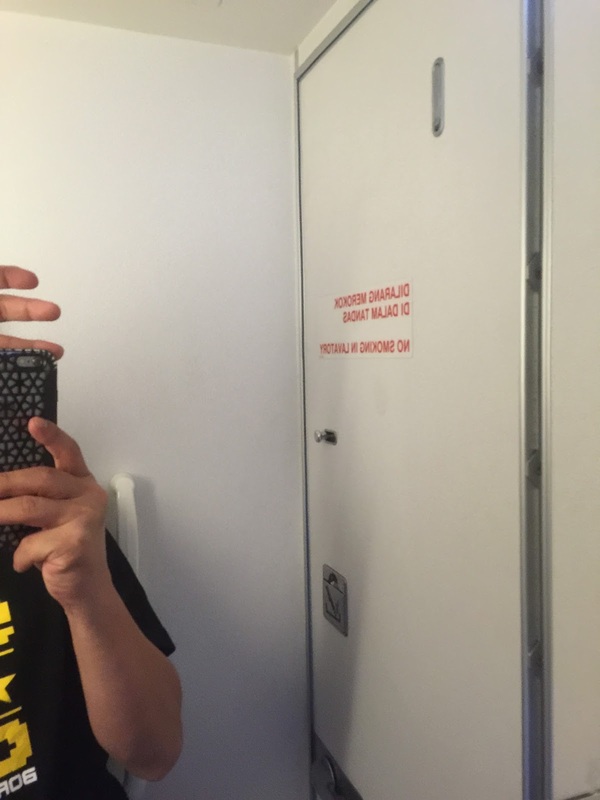 The lavatories is very clean thanks to the lighting and the clever use of mirrors by Malaysia Airlines. There isn’t any amenities other than the hand soap in the lavatory. Seats in the Economy Class cabin on board Malaysia Airlines A330-300 are arranged in 2-4-2 configuration. The Economy Class seats on board Malaysia Airlines are clad in bright red upholstery, with bright red headrest which is adjustable four ways. The 16 seats in the forward section has slightly wider pitch, measuring a good 36″ and a width of 17.3″. While seats in the main Economy Class cabin has a pitch of 32″. 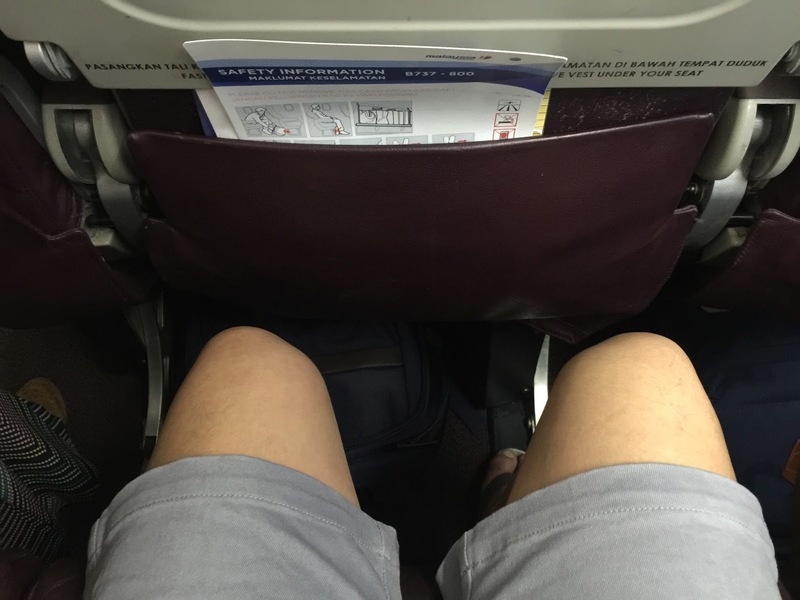 With 36″ pitch for those 16 seats in the forward section of Economy Class cabin, the legroom is very good. The seats moves forward when reclining, however it took some force for the recline to work well. As there are no seats behind me, my seat can stay reclined all the way after taking off till prior to landing. I highly recommend passengers flying on Economy Class on board Malaysia Airlines A330-300 to book seats in the forward cabin (Rows 9 and 10). 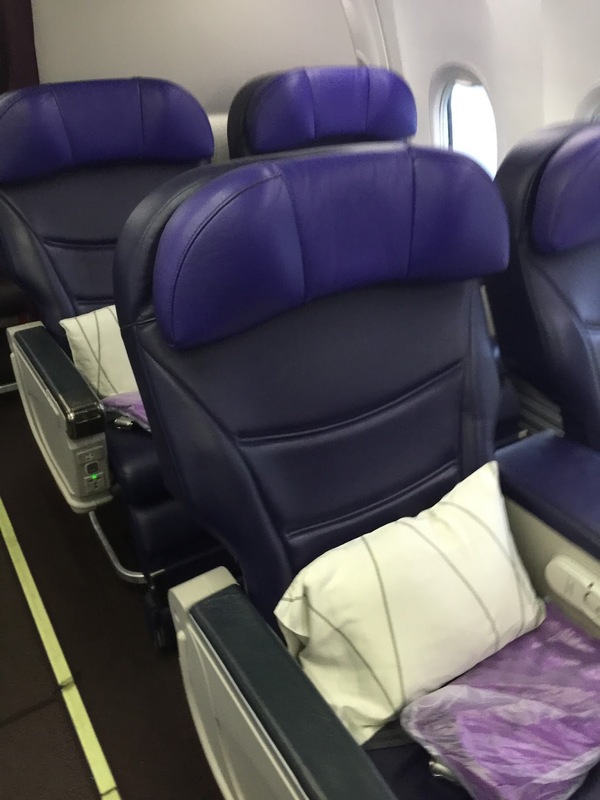 Pillows and blankets are not made available on the seat in Economy Class cabin, however Malaysia Airlines brings limited quantity of pillows and blankets on board. All the seats in the Economy Class cabin comes with a USB port for charging of mobile devices, located on the right beneath the TV screen. Headphone jack is found on the right armrest, while the seat recline button is located on the left armrest. 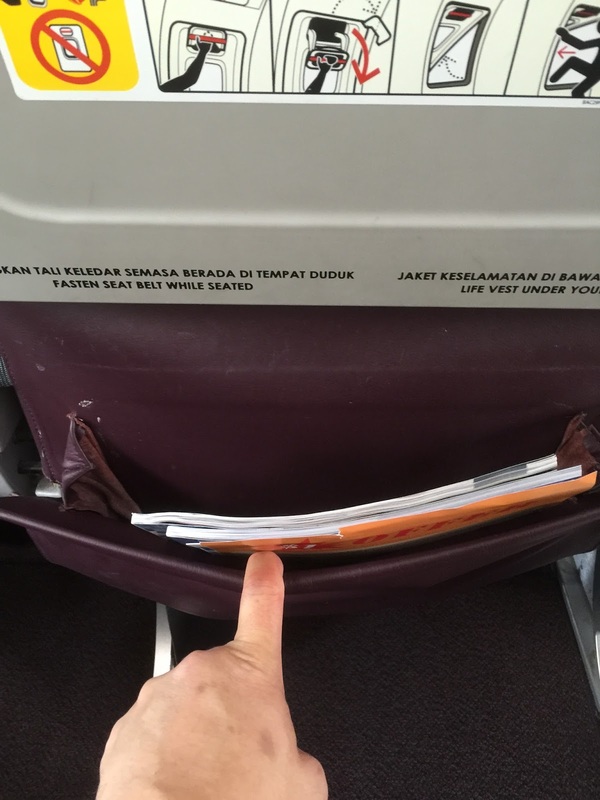 Unlike the B737-800, the tray tables in Economy Class cabin on board Malaysia Airlines A330-300 features a bi-fold function, which can be folded into half when passengers do not need to use the entire tray. This design also allows passengers sitting inside to access the aisle easier without having to stow the tray table. 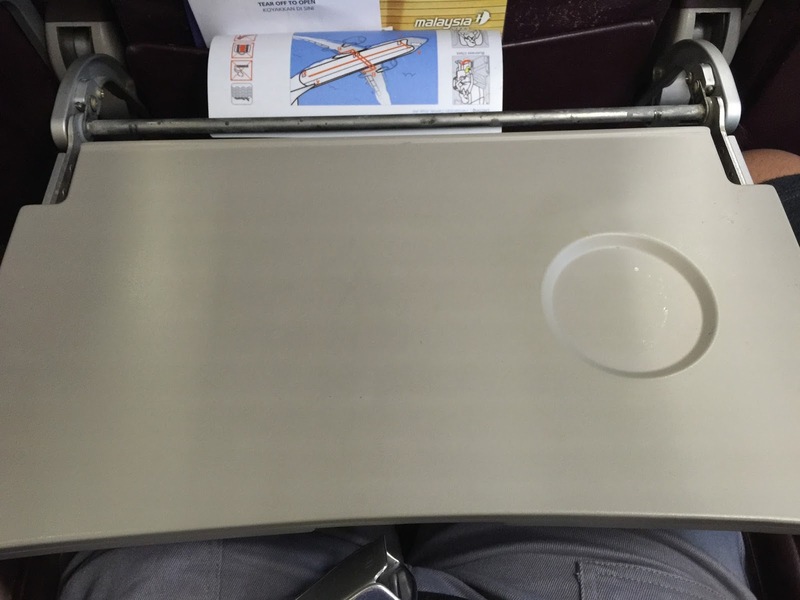 The tray table is large enough for passengers to put their laptop. The seat pocket is located on the back of the seat in front of mine. Seat pockets are deep enough for passengers to stow away small items they carry with them. In-flight magazine and duty-free shopping catalogue as well as the aircraft safety card are found in the seat pocket. All seats in Economy Class cabin are equipped with a 9″ personal TV screen. These TV screens have touchscreen function, however the touchscreen function lags when using it. I find using the remote control for selection of movies to be far less frustrating than trying to use the touchscreen function. The In-Flight Entertainment system was already turned on during boarding and remained on until we were deplaned, which helps passengers to kill time when boarding is still in progress. 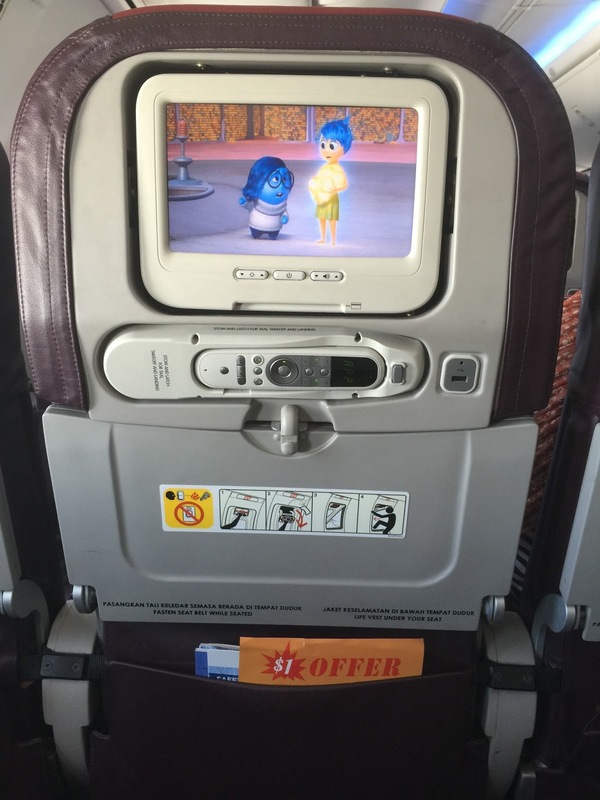 IFE system is well packed with movies, including the latest Hollywood blockbuster, as well as sitcoms for passengers who prefer to watch shorter films. The IFE on board features Audio Video on Demand, which gives passengers the flexibility to watch the shows as and when they like. IFE menu is well organised and designed in an initiative manner, which makes navigating through the menu for the movies I want to watch very easy. 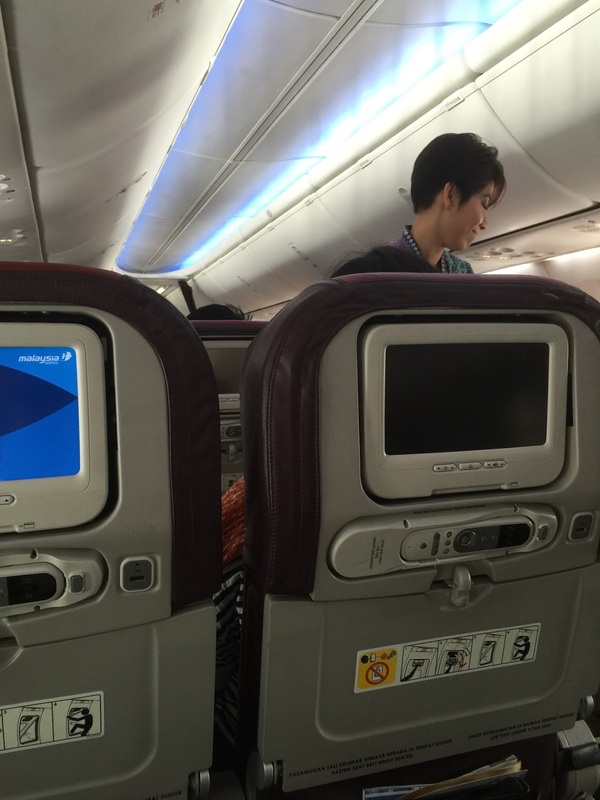 The IFE controller on board Malaysia Airlines Economy Class cabin is stored under the IFE TV screen. 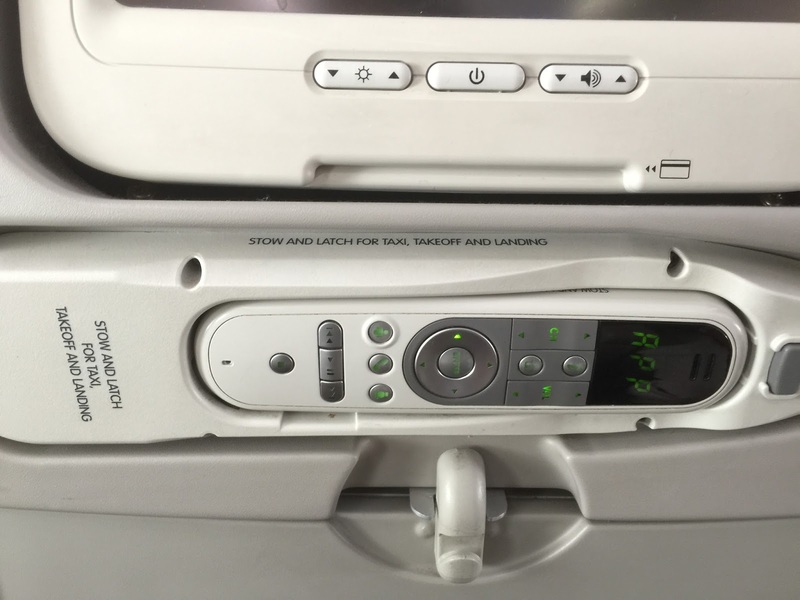 The design of the controller is similar to those found on other airlines, with all the controls that passengers needs to navigate the IFE menu on the front side of the controller. The attendant call button as well as the seat light control is also found on the front side of the controller. On the back side of the controller is where a qwerty keyboard and game control is found. 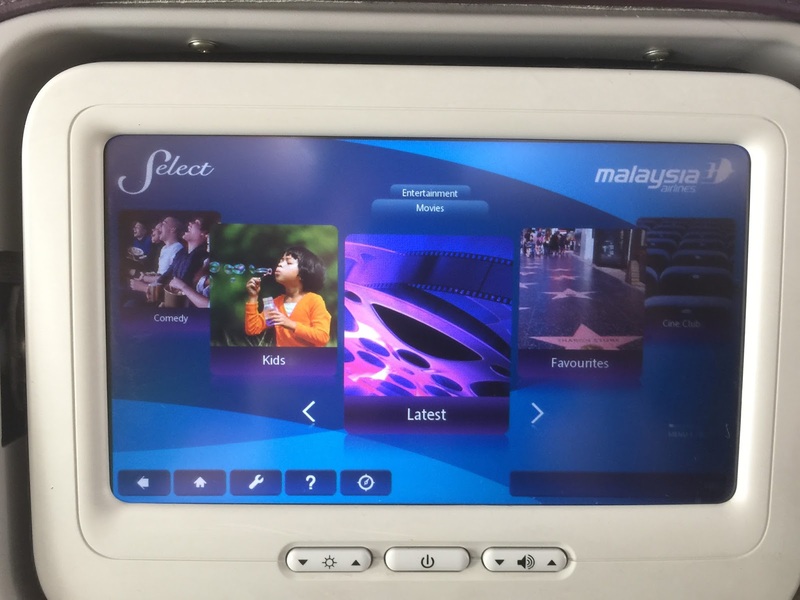 The IFE system on board Malaysia Airlines does not contain gaming or productivity options, hence these features on the controller does not serve any purpose. Headphone is made available in every seat in the Economy Class cabin onboard Malaysia Airlines at the time we board the plane. 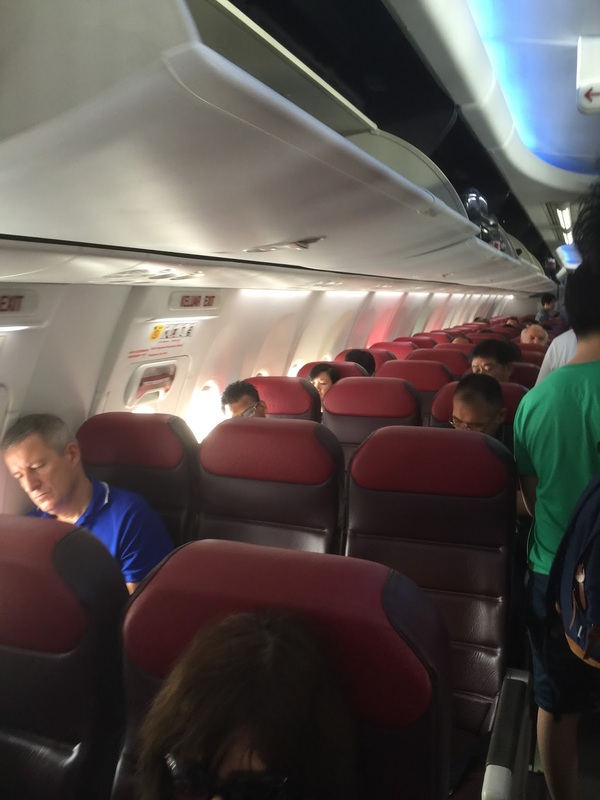 Food service commenced about 1 hour into the flight from Bali to Kuala Lumpur. As we were seated at the front of the Economy Class cabin, food was served in this section first. 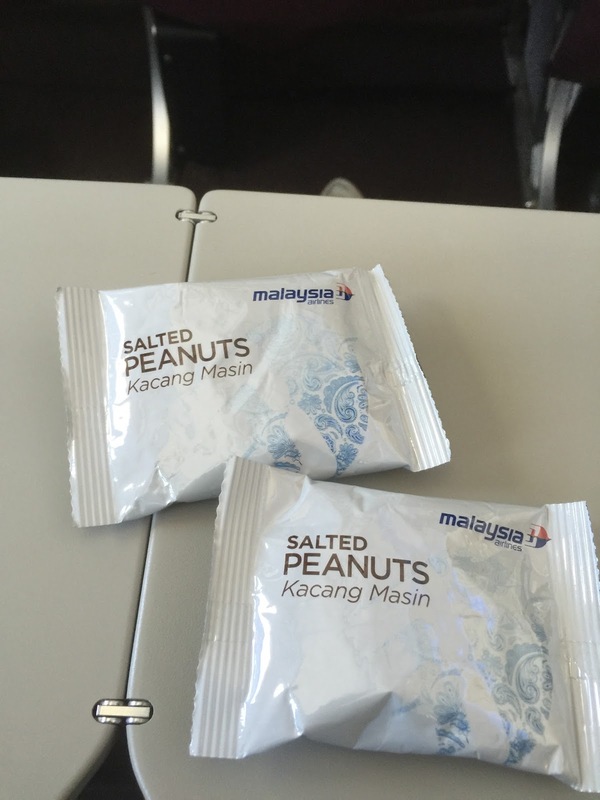 Food in Economy Class cabin on board Malaysia Airlines was served in a cardboard box, with a packet of peanuts, an oatmeal cookie and a small cup of water. Two options of main meal were offered for Economy Class passengers, Fish with black bean sauce and Chicken Nasi Briyani. I opted for the Fish with black bean sauce, while my friend opted for the Chicken Nasi Briyani. The fish in my meal was not crispy and the flavour is a tad blend. However the Chicken Nasi Briyani is a better choice as the chicken was tender and flavourful, the rice in the Nasi Briyani is well spiced and very flavourful. The flight attendants went around the cabin to serve beverage after the meal was served to all passengers. 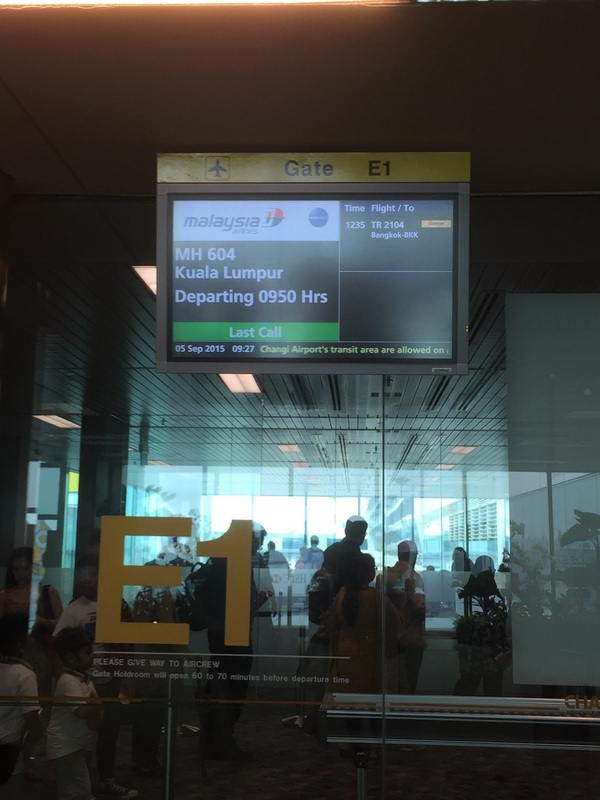 The service on board Malaysia Airlines is quite good, starting with boarding. We were greeted by friendly flight attendants as we were boarding the aircraft. We thought this is the standard greeting that most airlines accord to their passengers during boarding. The service extends beyond there. The service we received at the front section of the aircraft was spilled over from Business Class. While we did not get the pre-departure drink, when the flight attendants were distributing newspapers in Business Class cabin, those of us seating in the forward Economy Class cabin were offered newspaper from the push cart as well. 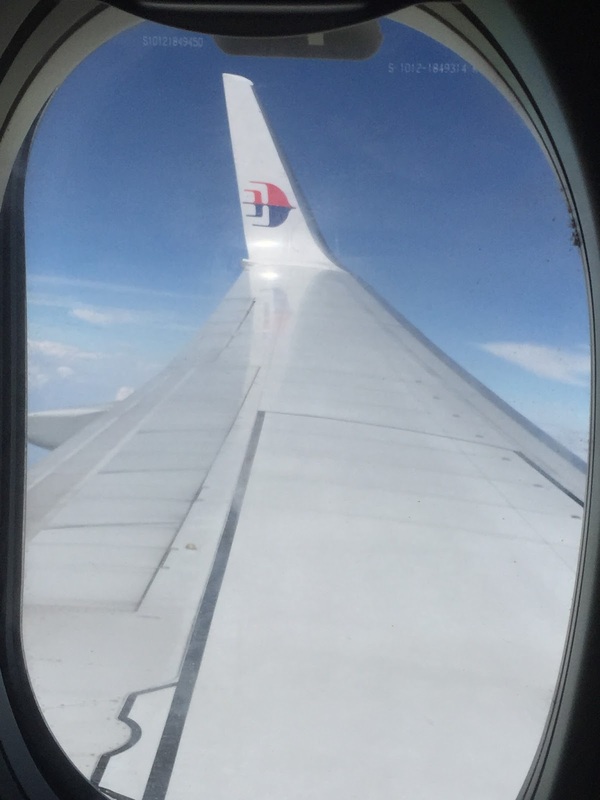 The flight attendants were seen wearing their smiles, despite a tiring return flight back to Kuala Lumpur and was seen patrolling the cabin constantly. When we requested for blankets and pillows, the flight attendants immediately attended to our requests. During beverage service, I casually told the flight attendant that I was very thirsty, she immediately gave me drinks with a smile. When she walked past my seat, the flight attendant even checked if I would need more drinks. Finished meals were cleared quickly so that we can either rest or continue watching the movies on the IFE. When the aircraft has landed, as we were waiting for the door to be opened, the flight attendant directed us to deplane from the Business Class door, which saved us time from waiting (as we had a connecting flight to catch). 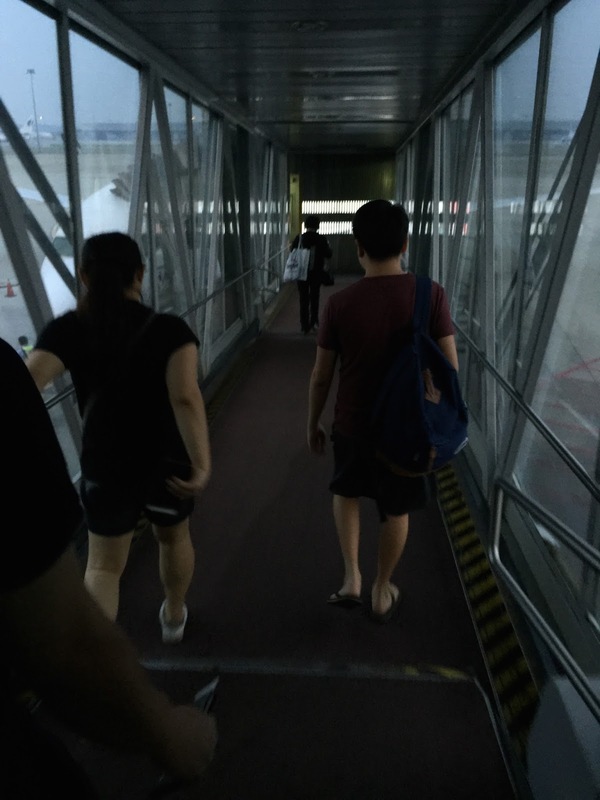 When we deplaned we realised that the aerobridge to Economy Class cabin doors were still being connected. Flying on Malaysia Airlines Economy Class in the forward section is very comfortable. The legroom is very generous and I like the quiet cabin environment up front. The seats has great recline, which allowed my friends to rest during the flight. We were the first ones to be served food and the food was tasty. The IFE was packed with movies and sitcoms, which kept me occupied during the 3 hour flight from Bali to Kuala Lumpur. The service rendered by the flight attendants were fantastic, flight attendants were seen wearing their smiles throughout the flight time. I think the seats upfront were sold by Malaysia Airlines as extra legroom seats, which we got without paying extra (thanks to the internet check-in option). This is the second leg of my trip via Malaysia Airlines from Singapore to Bali. 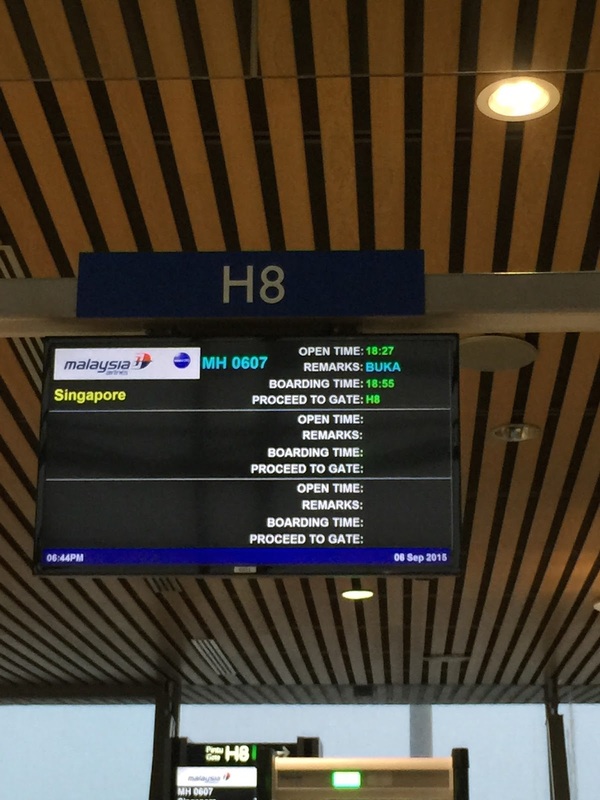 As there was a delay in takeoff at Singapore Airport, our transit time has been reduced from 1hr 20 mins to 45 mins. When we disembarked from the previous flight, we saw a ground staff standing at the gate with a paper stating the gate of our onward flight. 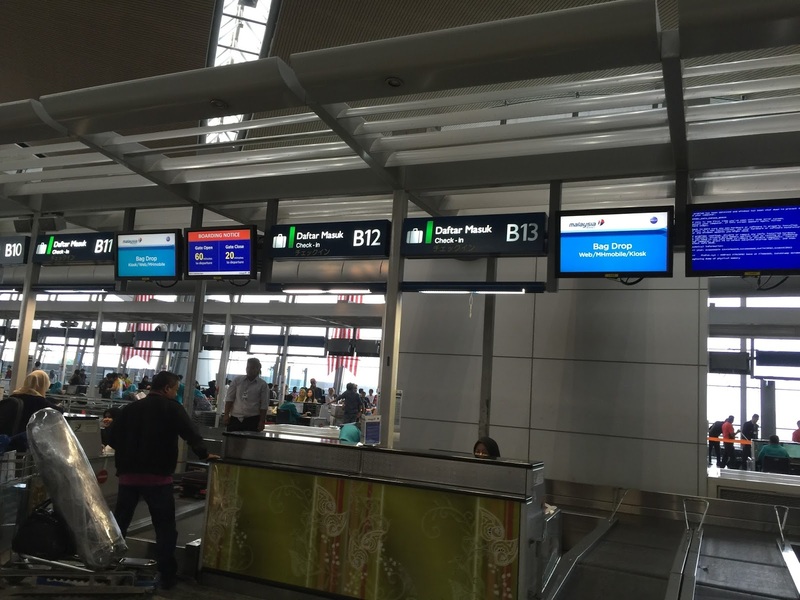 Our onward flight to Bali departs from gate G4, which is next to the gate of our onward flight. 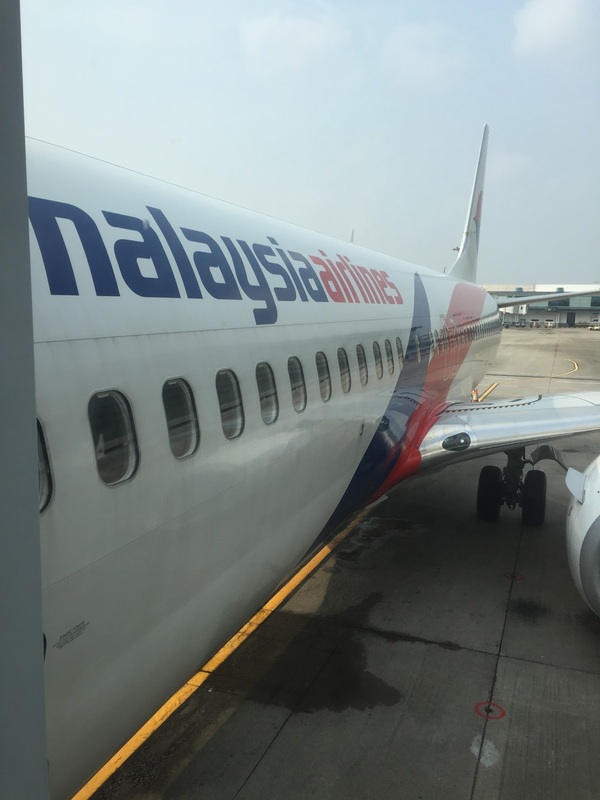 Malaysia Airlines uses B737-800 for Kuala Lumpur to Bali. This version of the B737-800 comes equipped with In-Flight Entertainment system (I termed this B737-800 V2 to differentiate the version without IFE in my previous post). The cabin in Malaysia Airlines B737-800 V2 looks bright, coupled with the use of white walls and white mood lighting during boarding, the cabin looks clean and fresh. 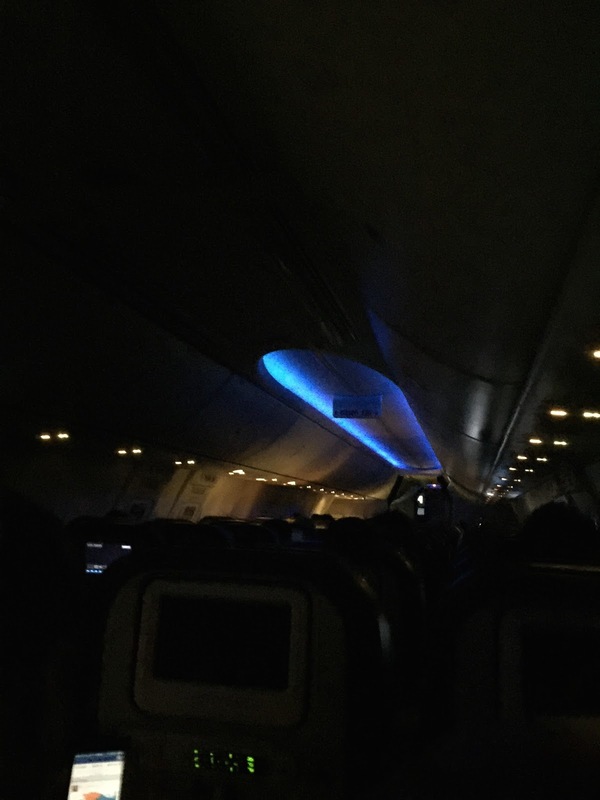 The pilot also uses different colour mood lighting during the flight to help passengers adjust to the time of the day. Economy Class seats are decked in two shades of red, with the main seat in maroon colour and bright red as the headrest. The tight leather wrapping on the seats makes the cabin look new and tidy. There are a total of 16 seats in Business Class and 144 seats in Economy Class onboard Malaysia Airlines B737-800 V2. There are only two lavatories onboard Malaysia Airlines B737-800 V2 in Economy Class, both are located at the rear of the aircraft. Due to the limited space onboard, the lavatories are a tad smaller compared to those found onboard larger aircrafts such as B777 series. However, the clever use of bright lighting and mirrors made the lavatory feels larger than it actually is. The lavatories housed the standard equipment like toilet and sink. 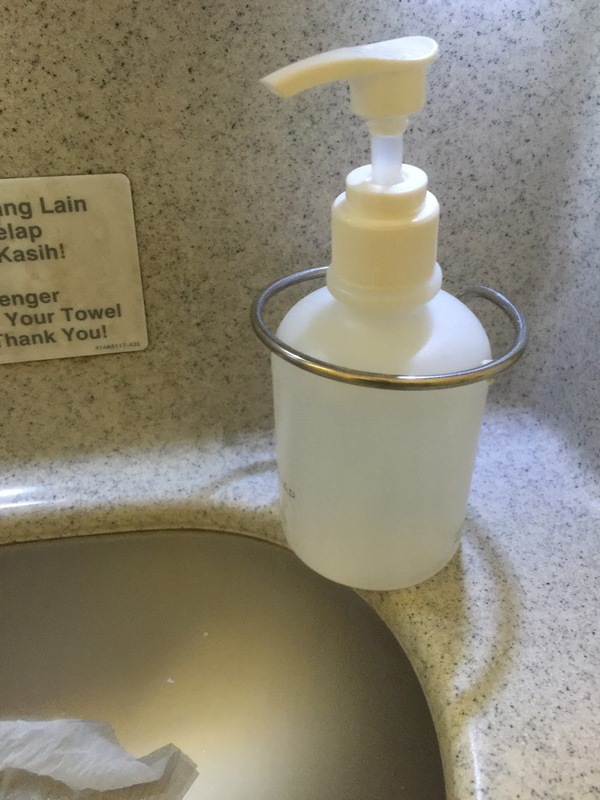 Onboard amenities in the lavatories are limited to hand soap other than paper cups and tissues (some other airlines still provide cologne and/or mouthwash). Seats in Economy Class cabin onboard Malaysia Airlines B737-800 V2 are arranged in 3-3 configuration. The maroon seats and bright red headrest measures 30″ in pitch and 17″ in width wrapped in cowhide leather. Unlike other airlines, the headrest cannot be adjusted. 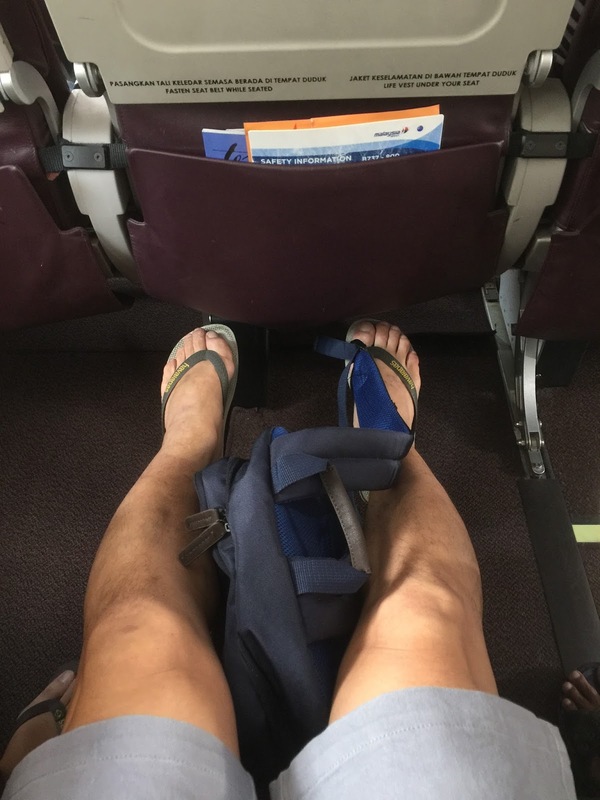 The legroom in the Economy Class onboard Malaysia Airlines B737-800 V2 is very good, I still had a good amount of space between my knees and the seat in front of me. There is a USB port located on the bottom right of the TV screen for passengers to charge their mobile devices. The seat recline button is located on the right armrest. 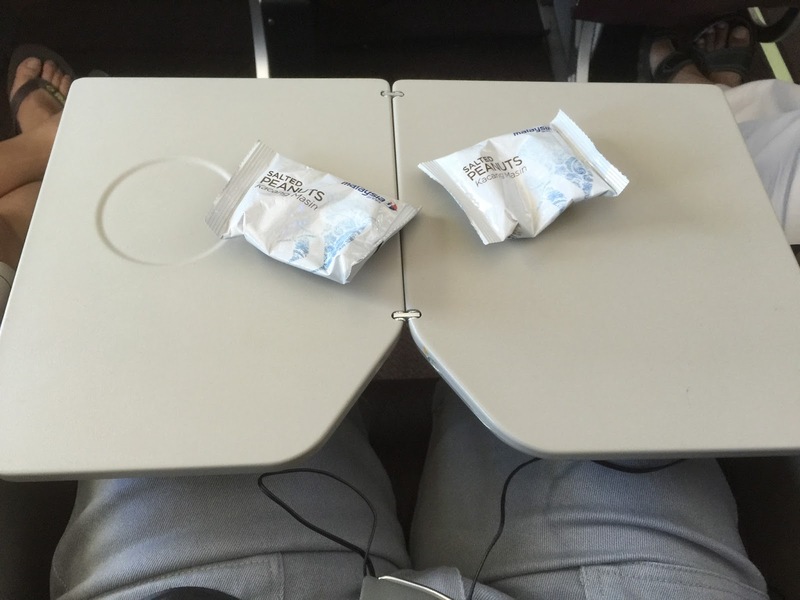 The Economy Class seats onboard Malaysia Airlines B737-800 V2 also comes with a single fold tray table, which is perfect for passengers who brought their laptop to work onboard. The seat pocket in the Economy Class cabin is fairly large and has only one tier, which is good enough for passengers to store small items. 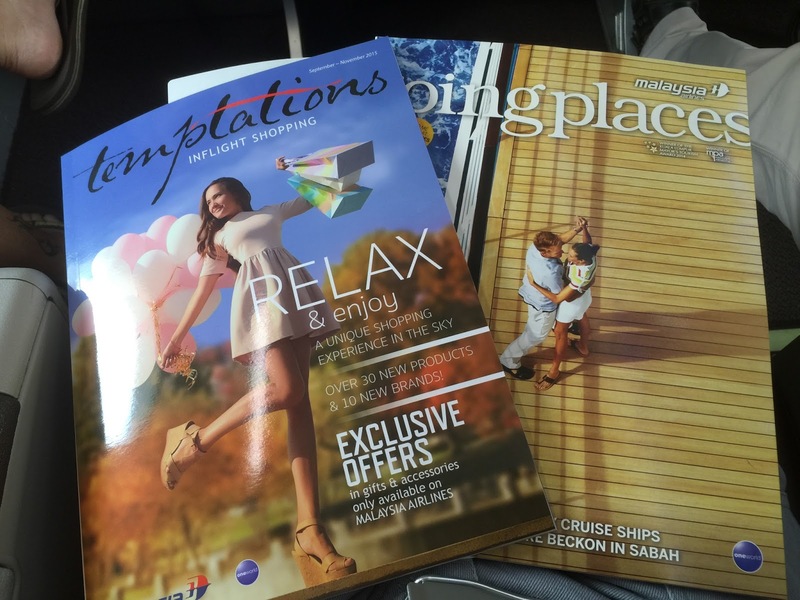 In-flight magazine, duty-free catalogue as well as the aircraft safety card are stored in every seat pocket onboard Malaysia Airlines. The in-flight magazine was very useful to help me kill time when the IFE was down halfway through the flight. Malaysia Airlines seem to be cutting operating costs as pillows and blankets have to be requested. During the flight, I attempted to request for a blanket and was told that there aren’t sufficient blankets carried onboard. All Economy Class seats onboard Malaysia Airlines B737-800 V2 comes equipped with on-demand In-Flight Entertainment system. Economy Class seats are fitted with 9″ touchscreen TV that kept me entertained during the flight. Despite TV screens having touchscreen function, the touchscreen function seems to lag quite a bit and I find using the remote control to be a lot less frustrating when navigating through the IFE menu. The IFE is loaded with a large collection of movies and TV shows, some of which are fairly recent Hollywood blockbusters. However halfway throughout the flight, the IFE hanged and there were no attempts by the flight attendants to reset the system despite being a three-hour flight. The IFE controller is stored beneath the TV screen, which has functions such as seat lighting control, flight attendant call buttons on top of the four-direction control panel for navigation of the IFE system and the standard video control functions. 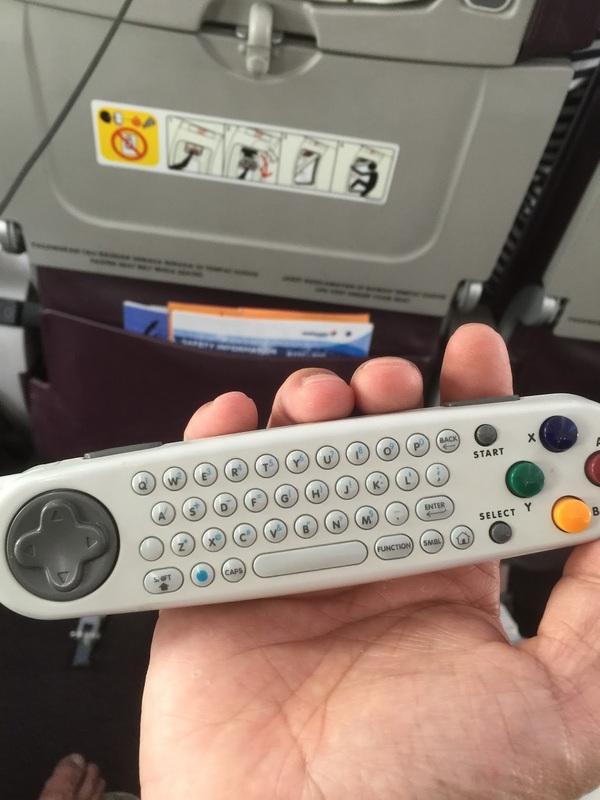 A qwerty keyboard is found on the back of the IFE controller, which serves no function as there are no items on the IFE menu that warrants the use of the keys on the back of the controller. 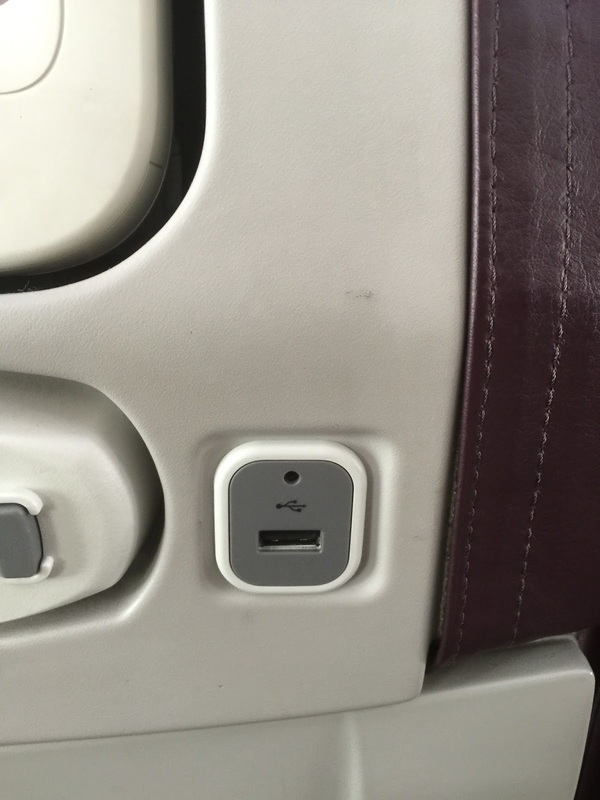 Headphone jack for the IFE is located on the right armrest. Headphones are already being placed on every seat at the time of boarding. These headphones were collected prior to landing for recycling purposes. Food was served about one hour from taking off. Unlike most airlines which served food in a tray complete with salad and dessert, food offering was a tad simpler in the Economy Class cabin onboard Malaysia Airlines B737-800 V2. Food was served in a cardboard box, that contains the main meal, an oat biscuit and a packet of peanuts on top of a small cup of water. 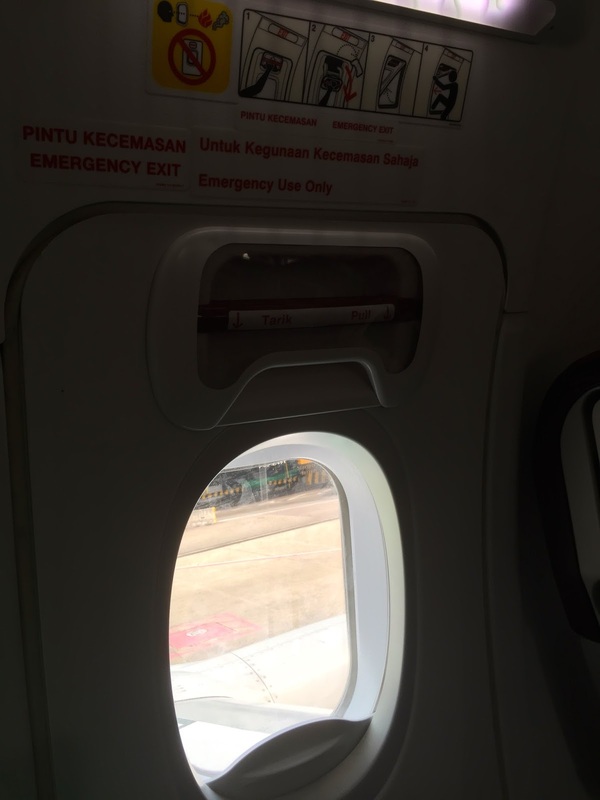 On this Kuala Lumpur-Denpasar flight, passengers in Economy Class cabin were given the choice of Roasted Chicken Rice or Fried Fish with rice. I opted for the chicken rice and the chicken rice is very tasty. Rice is full of flavour and the chicken is tender and juicy. It is a pity the portion served is a tad small. After all the passengers were served with food, the flight attendants went around the cabin to serve beverages. The service onboard is the Economy Class cabin on this Malaysia Airlines flight is rather mediocre. There is hardly any smiles on the flight attendants. I pressed the call button to request for pillows and blankets, the flight attendants did not seem to bother to bring me these items the first time around. I had to request for another time before a pillow is being brought to me. During meal service, it is apparent that the flight attendants serving the Economy Class cabin rushed to complete meal service. The flight attendants disappeared into the rear of the aircraft and were not seen during the flight other than during meal service and prior to landing. One of the attendants convenient skipped asking my row for beverages during the beverage run. When requested for beverage, the attendant gave an irritated look on her face. 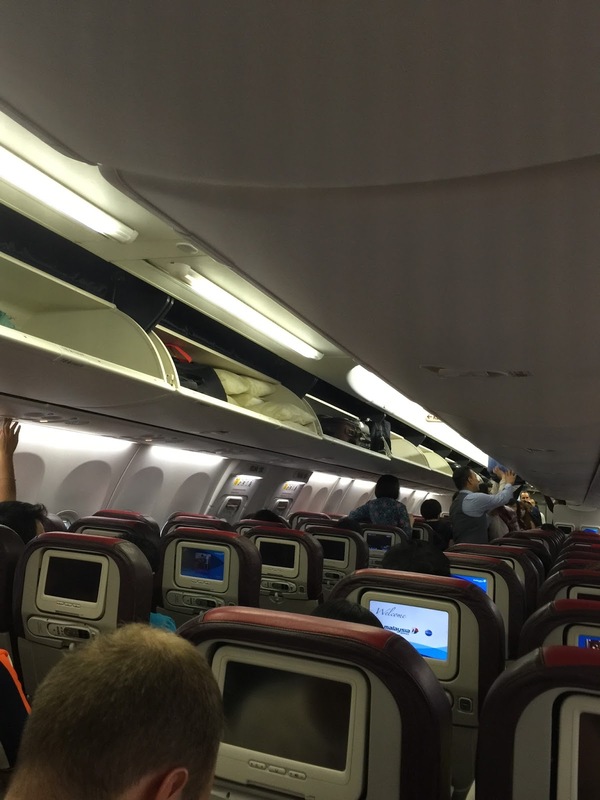 Economy Class seats onboard Malaysia Airlines B737-800 V2 is very comfortable for the three-hour flight time to Bali. The Economy Class cabin looked modern and feels clean, thanks to the colour scheme and the bright lighting used throughout the flight. The IFE system was easy to navigate and provided me with entertainment halfway through the flight. It would be perfect if the IFE had not hang halfway through the flight or that the flight attendants did their due diligence to reset the system rather than leaving it hanged. The catering onboard in the Economy Class was tasty, but the portion is a tad small. The service onboard is less than desirable. The flight attendants did not seem to put in the effort to provide any form of service other than distributing food and drinks and collecting the used headset. 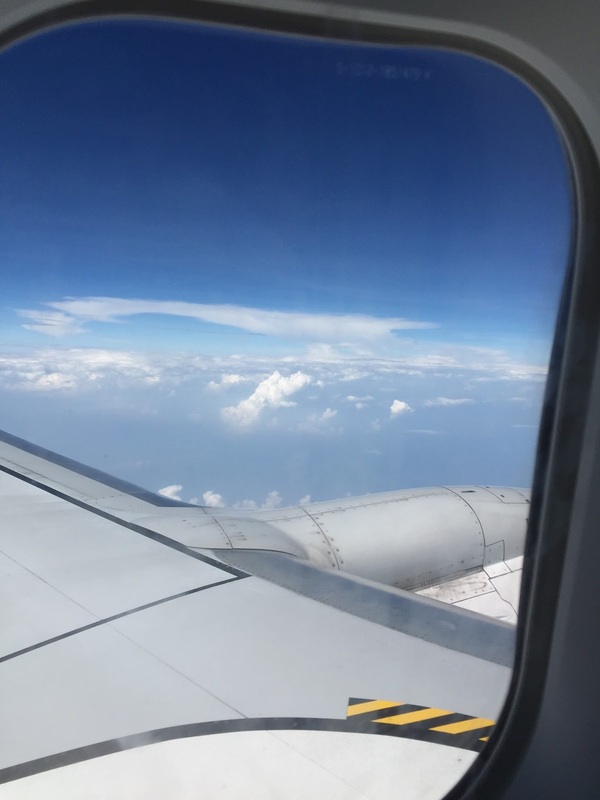 This is a trip that I took with my friends to Bali from Singapore via Kuala Lumpur due to the cheaper fares for the Singapore holiday period. 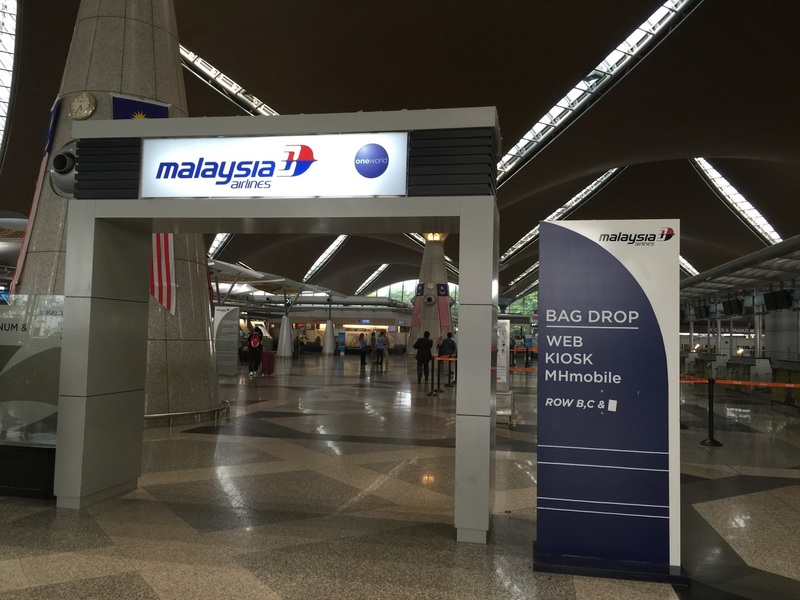 Malaysia Airlines operates 9 flights daily between Singapore to Kuala Lumpur. 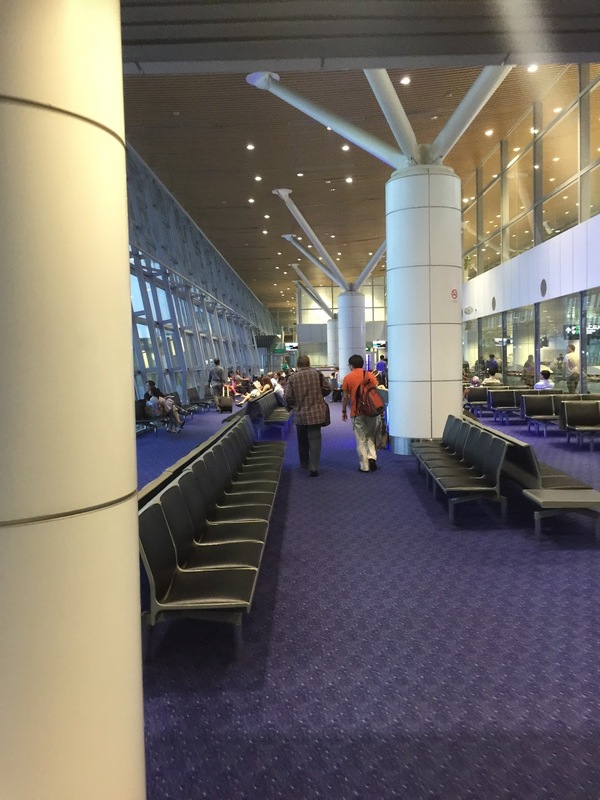 The airlines fly out of Singapore Changi Airport Terminal 2. 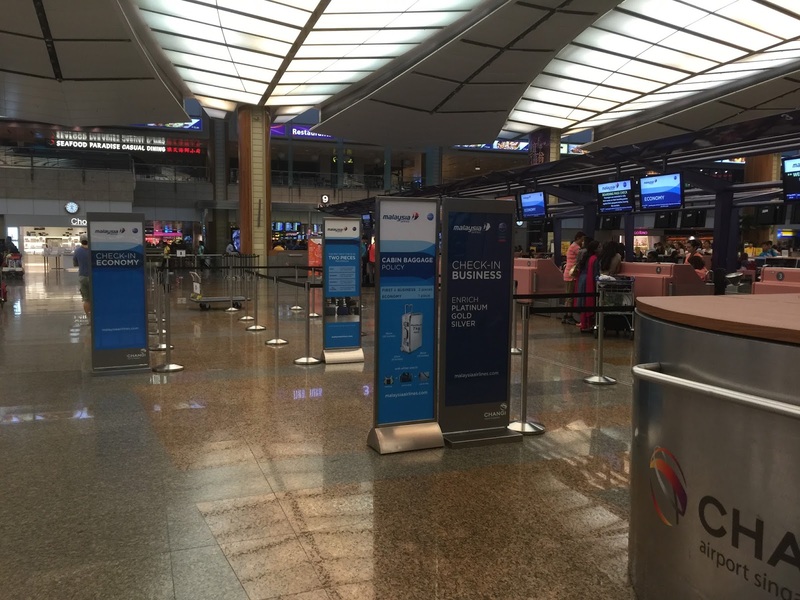 The check-in counters for Malaysia Airlines is located at Row 5, in the middle of the terminal. 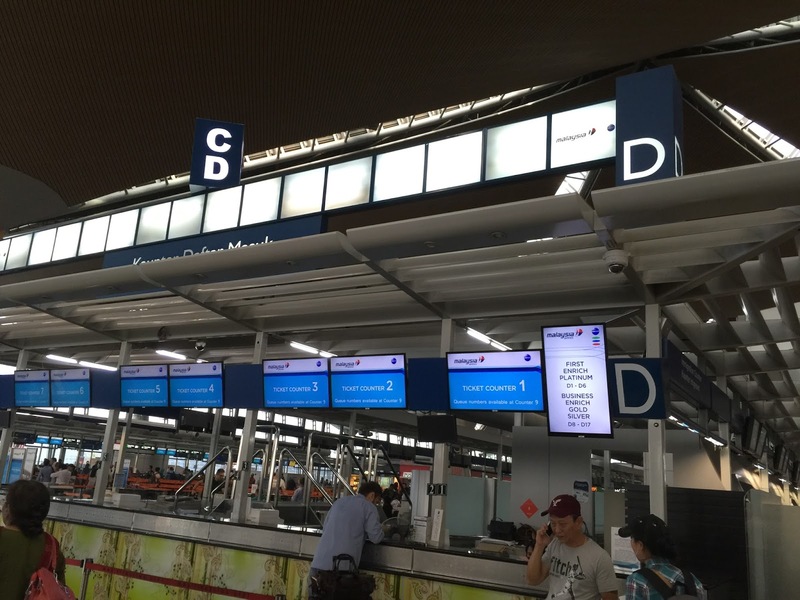 There are 3 counters opened at the airport terminal at the time of our checking in with 1 dedicated for Business Class passengers and 2 for Economy Class passengers. Out of the 3 counters, only 1 counter was manned, perhaps due to our flight being scheduled 3 hours at the time we check-in. 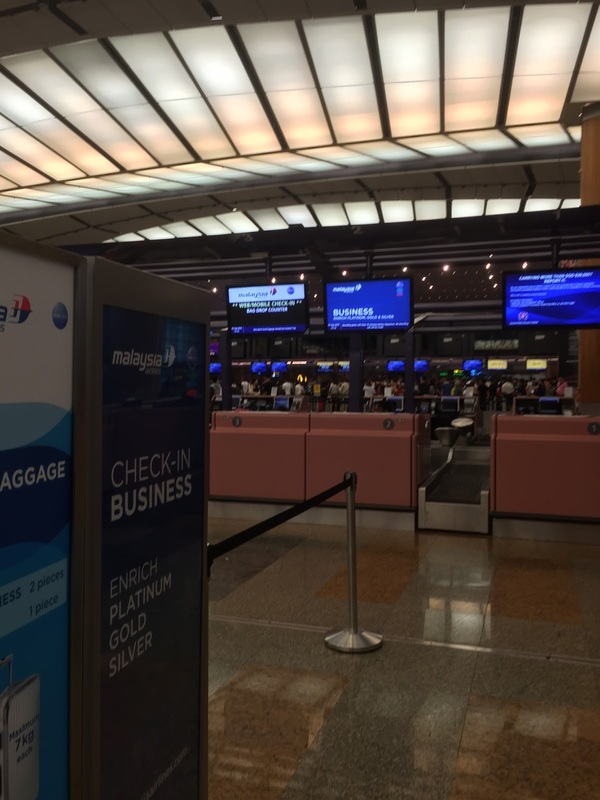 Unlike some other airlines, Malaysia Airlines did not seem to cater any counters for passengers who have completed their check-in online. There was no queue at the time of our check-in and we were served immediately when my friends and I entered the queue. The ground staff handling our check-in was friendly and processed our check-in efficiently. She also briefed us on the time we should appear at the gate and our gate number. 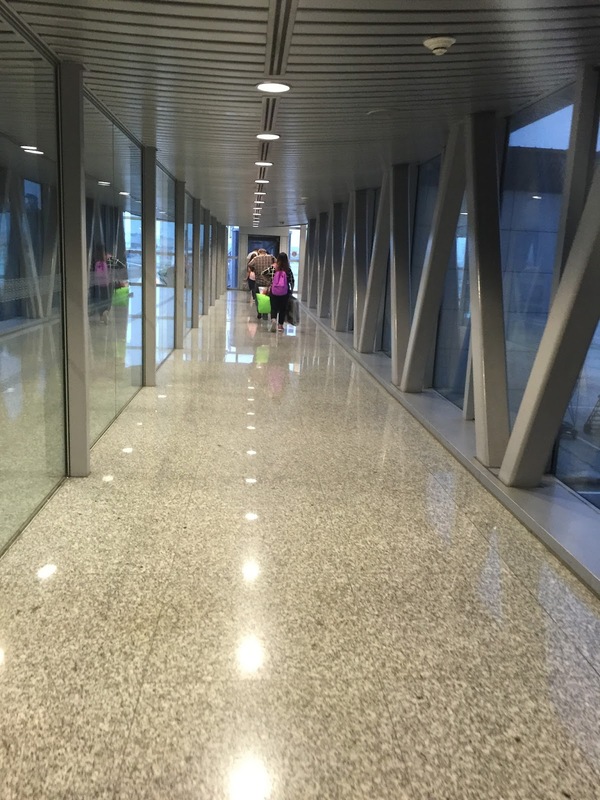 As we are connecting via Kuala Lumpur, the ground staff placed our Kuala Lumpur to Bali boarding passes into an envelop and placed our Singapore to Kuala Lumpur boarding passes into our passports. 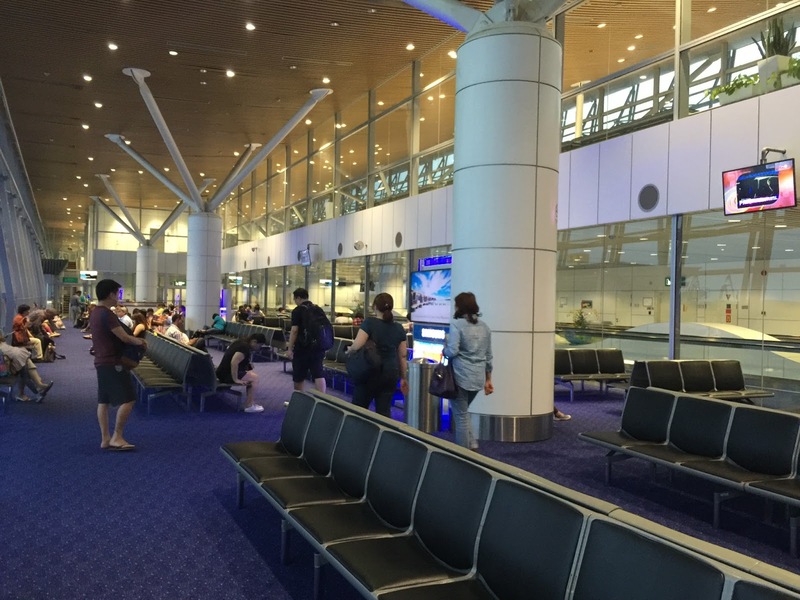 This provided us with the convenience of not having figure out which boarding pass should we be using for Singapore to Kuala Lumpur sector. Malaysia Airlines uses B737-800 for the Singapore-Kuala Lumpur route. 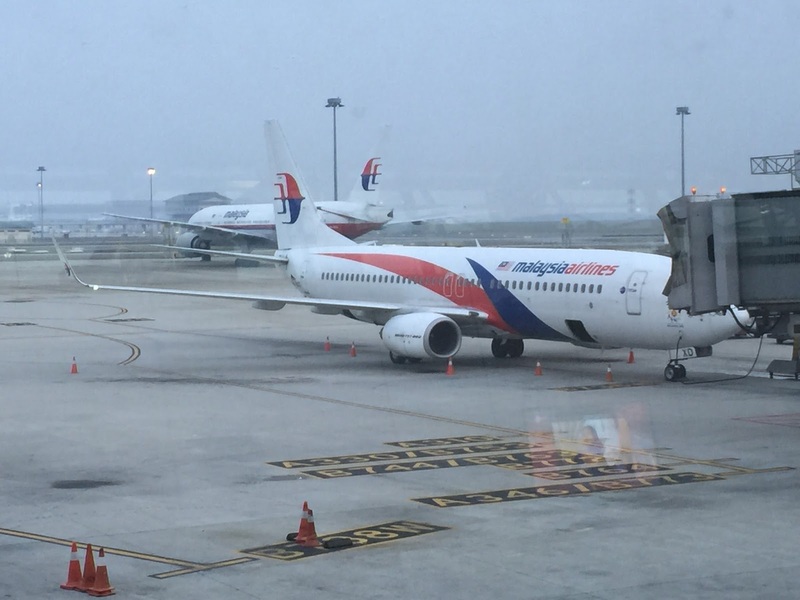 There are two versions of the B737-800 that Malaysia Airlines is using, one is the refurbished version that comes with In-Fight Entertainment units, while the other seems older without IFE. I term the version without IFE as V1 (though not official from Malaysia Airlines) and the version with IFE as V2. 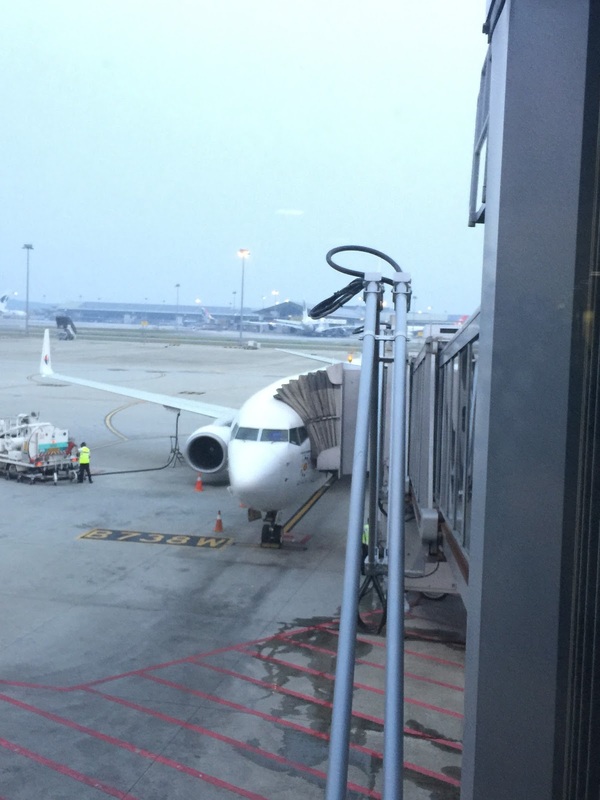 For both legs between Singapore and Kuala Lumpur, Malaysia Airlines uses the B737-800 V1. The Malaysia Airlines B737-800 V1 cabin is a tad dull decked with dark blue seats which gives it an aged look. The use of white bulkhead in the cabin and yellow mood lighting during boarding and throughout the duration of the flight gives it a clean feel but did little to give the cabin a newer look. 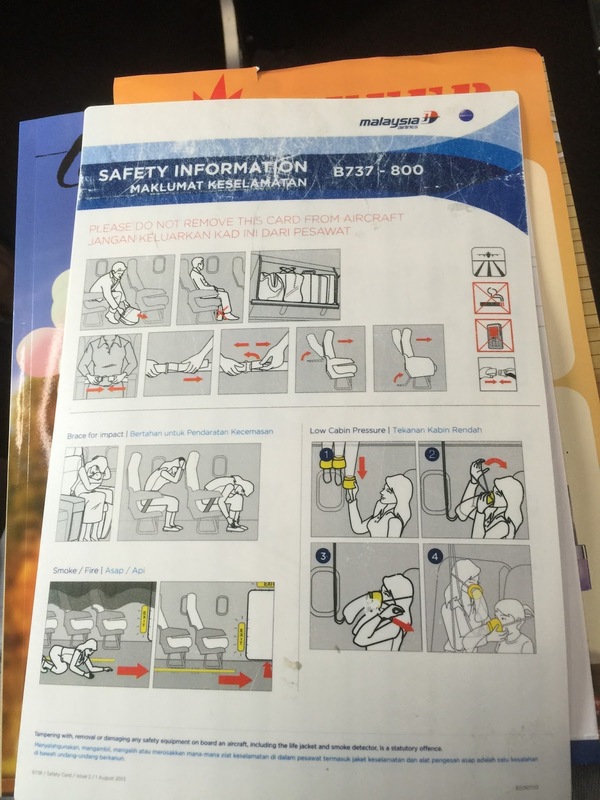 Malaysia Airlines B737-800 V1 comprises a small section of 16 seats in Business Class at the forward of the aircraft and 144 seats in Economy Class, separated by a wall. There are only two lavatories in the Economy Class cabin serving all 144 passengers, both are located at the rear of the aircraft. Despite the small size of the lavatories, they are kept clean by the busy attendants. The use of bright lighting and mirrors in the lavatories made it look larger than it is, reducing the feel of claustrophobic for passengers. 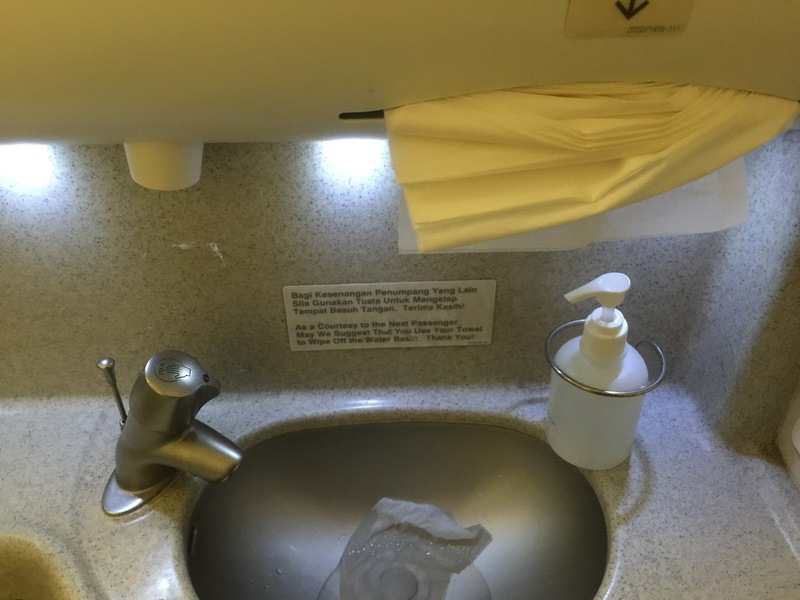 Lavatories are equipped with the standard essentials that are found onboard most aircrafts such as push button taps and toilet with trash bin being placed below the sink. The amenities in these lavatories are limited to hand soap and tissues. Seats in the Economy Class onboard Malaysia Airlines B737-800 is arranged in 3-3 configuration. 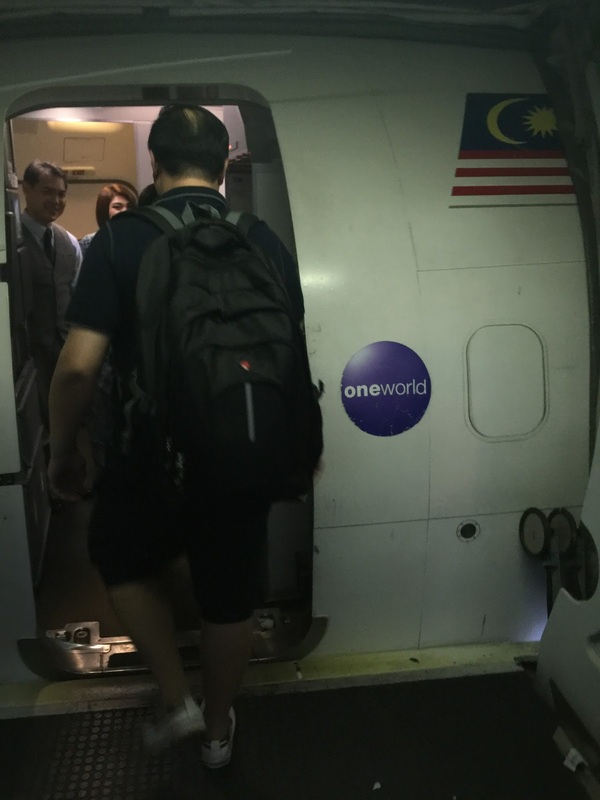 Each seat has a pitch of 30″ pitch and a width of 17″, which is fairly comfortable for this 50 mins flight time between Singapore and Kuala Lumpur. 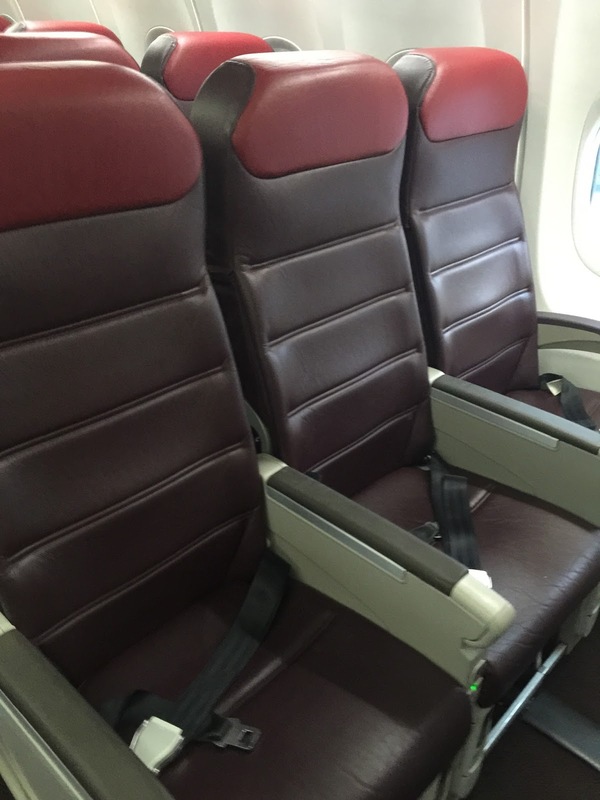 All the seats in Malaysia Airlines B737-800 V1 Economy Class cabin are wrapped with cowhide leather. The legroom in the Economy Class cabin is very good with a good amount of space between my knees and the seat in front of me. I did not feel cramped up in the Economy Class cabin seat. As with most airlines, the tray table onboard Malaysia Airlines B737-800 V1 is found on the back of the seat in front of me. The tray table does not have a bi-fold function and is large enough for me to browse through the in-flight magazine on. 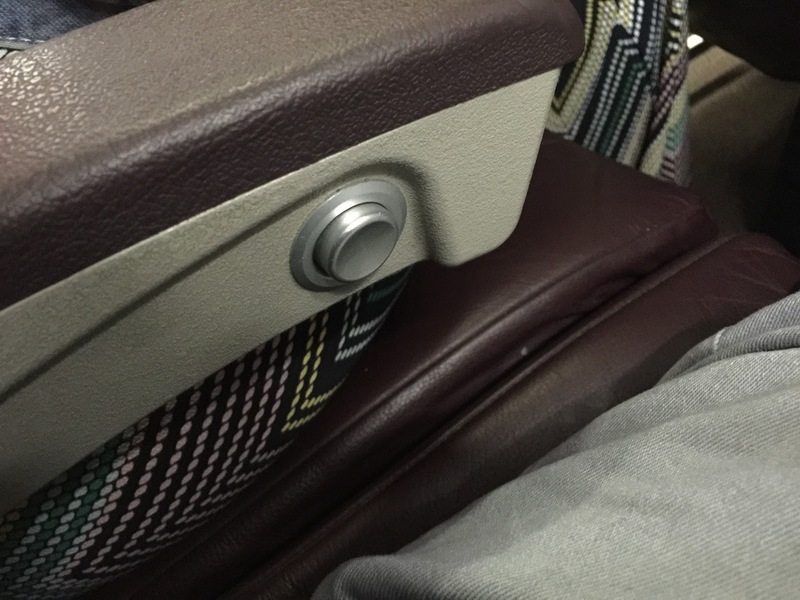 The seat reclined button and the 2-pin headphone jack is found on the right armrest. As the B737-800 V1 is an older aircraft, the lighting control, air vents and the call buttons are located on the ceiling above my seat. The seat pocket is located in front of my seat is fairly deep (but dirty) where one can find a copy of Malaysia Airlines in-house travel magazine as well as the aircraft safety card. There are no amenities such as pillows, blankets and handphones on the seats in the Economy Class cabin. 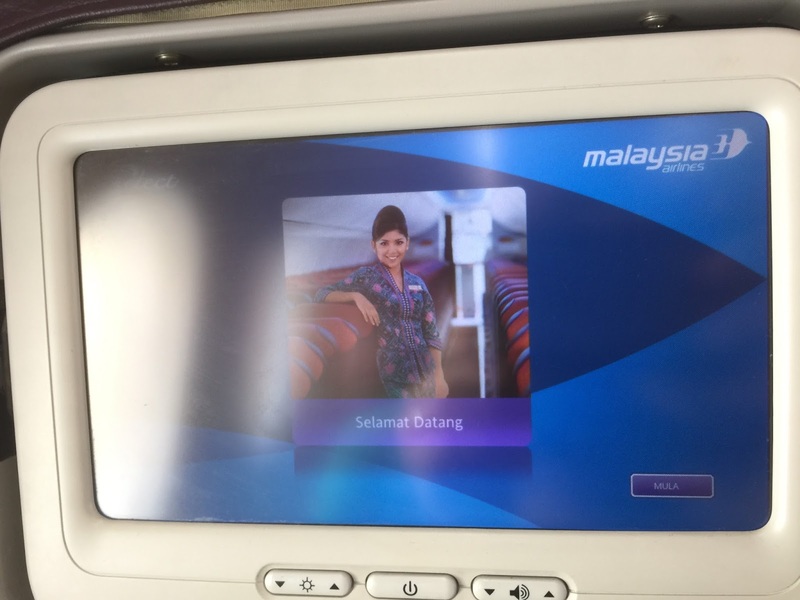 In-Flight Entertainment is non-existent on Malaysia Airlines B737-800 V1. There is a small panel on the right armrest which seems to provide some form of in-flight radio entertainment. 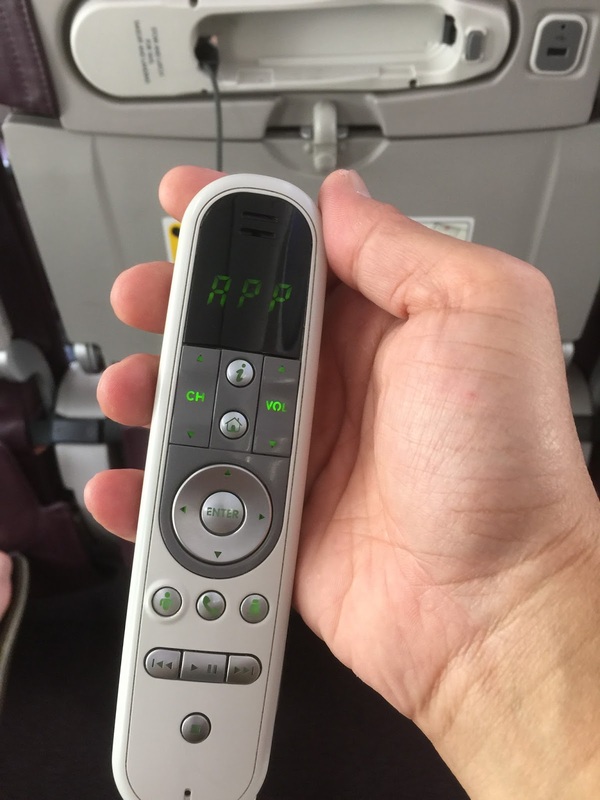 I did not test out if there are indeed any in-flight radio as Malaysia Airlines does not provide headphones for this short 50 min flight between Singapore and Kuala Lumpur. The only other form of entertainment onboard is the drop-down TV screen on the ceiling, but these screens are only used prior to take-off for the safety video. They remained undeployed throughout the flight time. 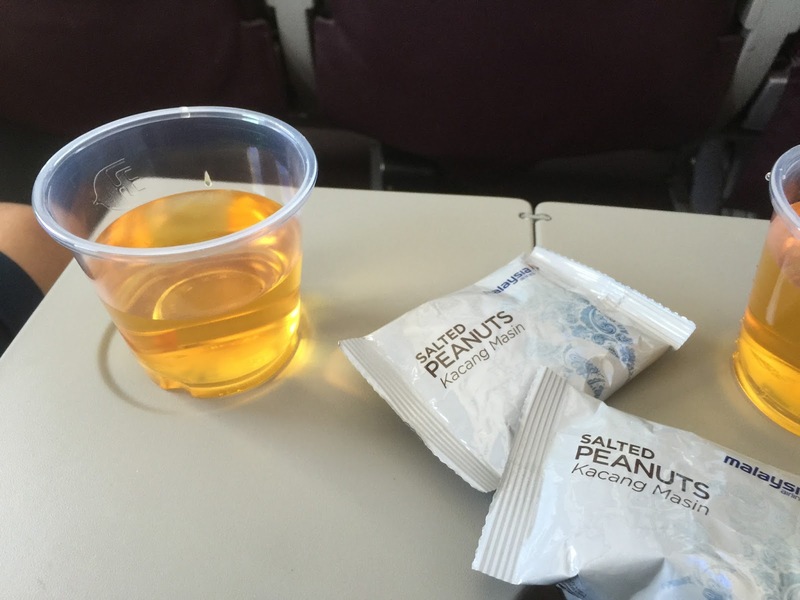 Due to the short flight time, each passenger is given a packet of peanuts and a cup of orange juice. I requested for an additional packet of peanuts, which the flight attendants are happy to provide. The service onboard Malaysia Airlines B737-800 V1 plying between Singapore and Kuala Lumpur is good. The short flight time provided minimum interaction between flight attendants and passengers. Flight attendants are seen helping passengers finding their seats and stowing their luggage in the overhead bin during boarding. 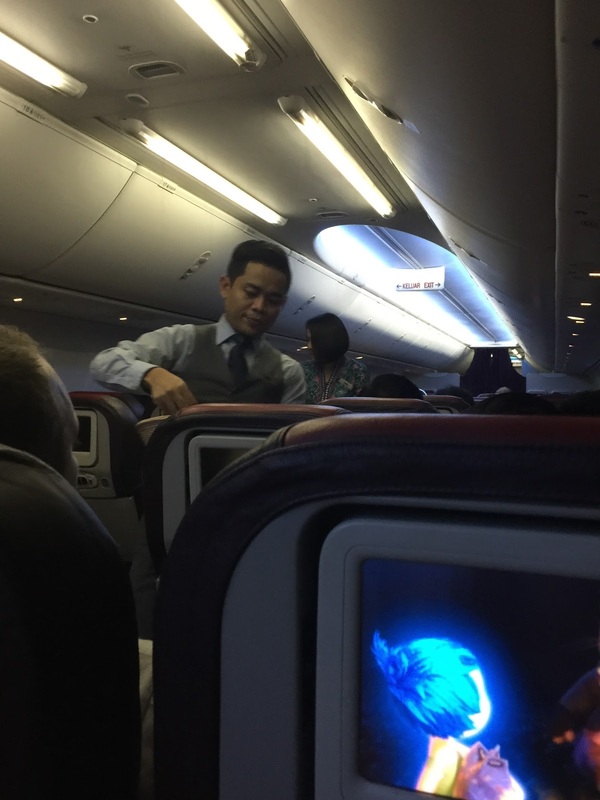 Despite the short flight time and only two flight attendants serving more than 100 passengers, the flight attendants are seen wearing smiles on their faces during the service run. The flight attendants went around serving peanuts and drinks as soon as the seat belt sign is turned off, ensuring that all passengers in Economy Class cabin get the drink and the peanuts. Despite the lack of IFE and the ageing aircraft, Malaysia Airlines B737-800 V1 is comfortable for the short 50 min flight time. Passengers would not have much time to watch any shows even if IFE is available. Despite the hectic schedule, the flight attendants in the Economy Class cabin are still seen wearing smiles on their faces when interacting with passengers. Malaysia Airlines (MH) departs from Terminal 2 in Singapore Changi Airport. The Airlines check-in is located in row 9, which is situated towards the end of the terminal. 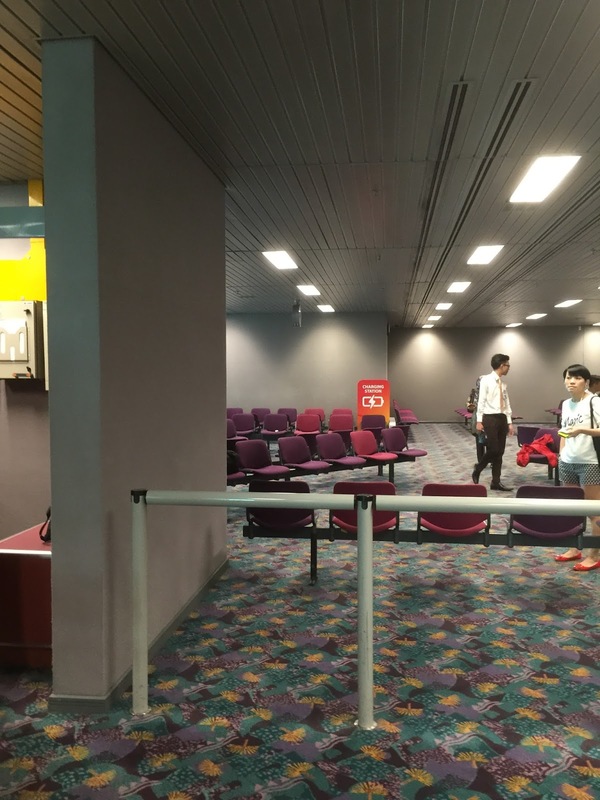 However the location of the check-in counter is right in front of the second immigration entrance of the terminal building. 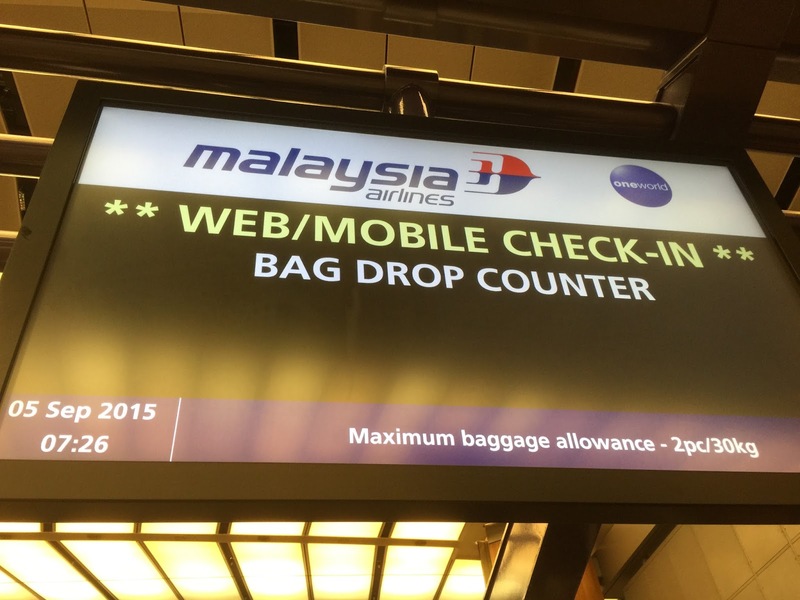 MH has a mobile check-in service for its flights and there are delegated queues for passengers who have done their check-in online or through their mobile web. At the time my checking in, the queue was thin and I hardly have to wait to get my boarding passes. I requested for emergency seats, the staff happily gave me the seats that I wanted. Checking in was fast (I did not have any luggage to be checked in anyways), after printing the boarding passes, the staff briefed me on the standard gate number and time for boarding, before sending me away with a smile towards the immigration gate. 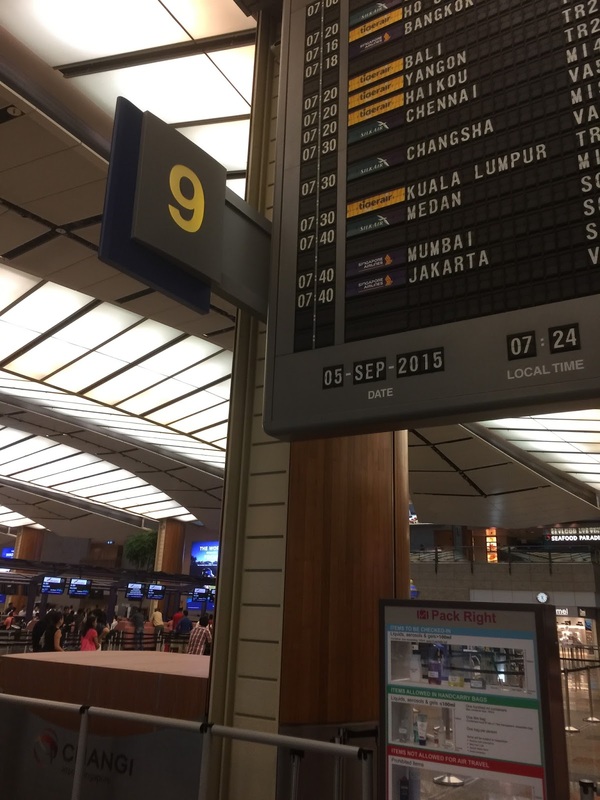 The flight to Kuala Lumpur departs at gate E1 in Singapore Changi Airport. The gate is located fairly close to the duty free shopping. 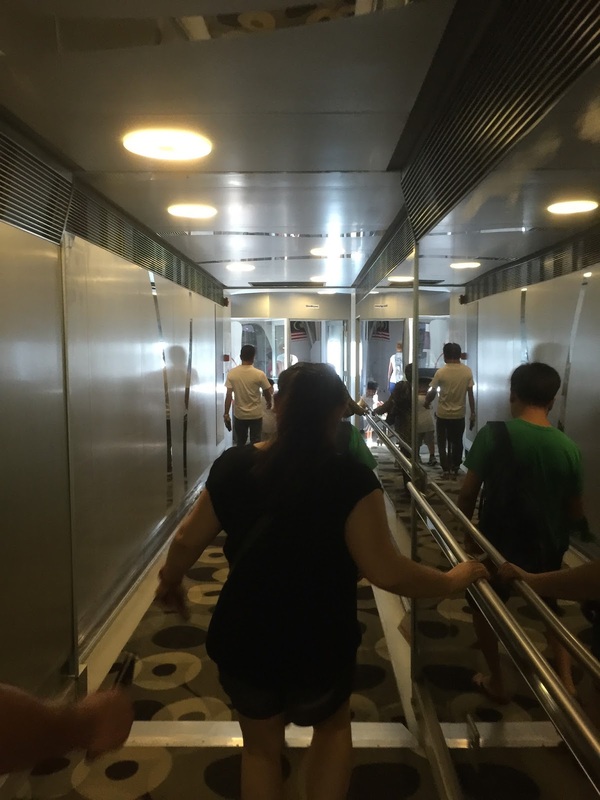 There isn’t any view of the aircraft at the boarding gate as the aerobridge blocked the view of the aircraft. By the time we arrived at the gate, it is practically empty as the load for this leg is rather light. 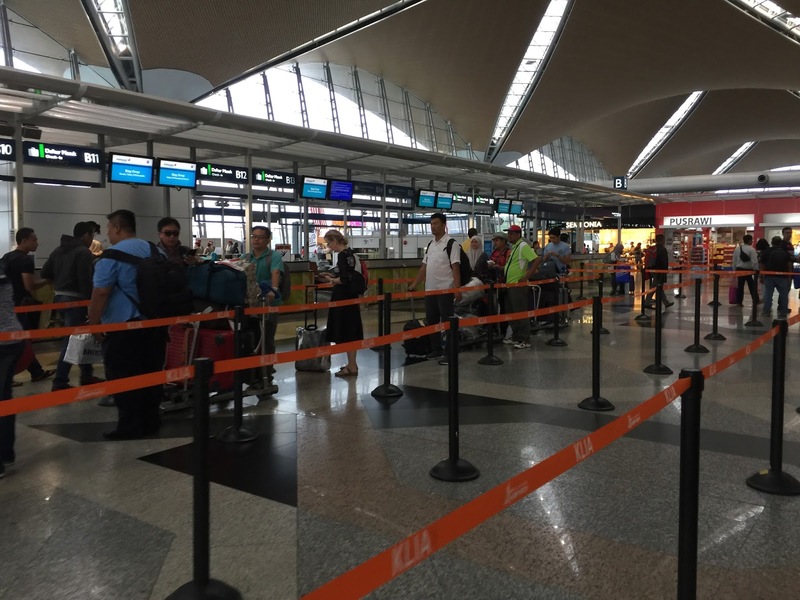 The check-in rows in Kuala Lumpur International Airport (KLIA) for MH spreads across 4 counters from rows A to D located at the first few rows of the terminal. For mobile or internet check-ins, passengers are free to choose between rows B or C depending on the queue. There was a queue at the check-in counter for internet/mobile check-in, however I only have to wait for around 5 mins for my turn to check-in as there are plenty counters opened for checking in. The staff at the counter was friendly and serviced with a smile. Check-in process is pretty fast for a party of 4, the staff did the standard fair of briefing us the boarding gate and boarding time. After immigration in KLIA area is pretty boring, not too many shops or restaurants around. If one has the time, one can consider taking the train to the satellite terminal, where one can find more shopping and restaurants. 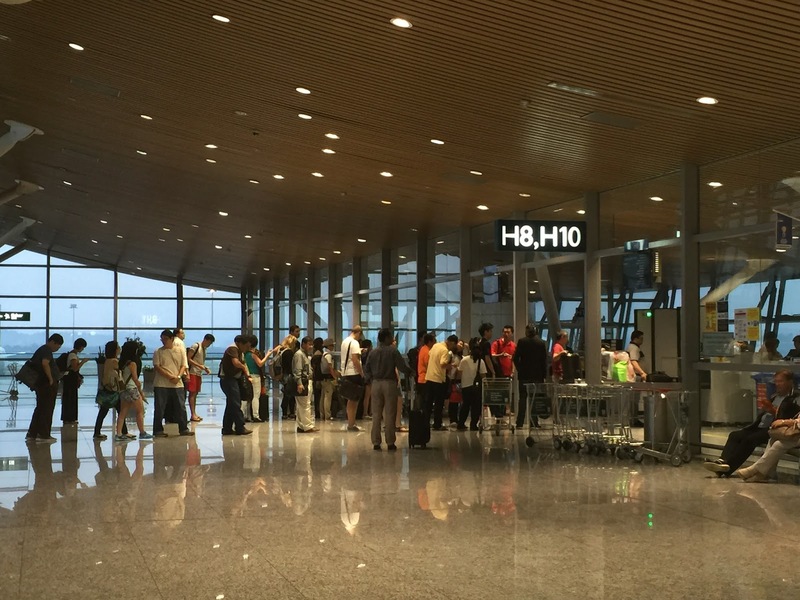 The flight from KUL to SIN departs at H8, located at the far end of the terminal building. There was a long queue getting into the gate as the flight was operating on full capacity due to few airlines code sharing the same flight. The boarding area is nicely and cosily decorated. Boarding commenced shortly in an efficient way soon shortly after we arrived at the gate. MH operates 737-800 for the SIN-KUL route, with 2-class cabins namely Business Class and Economy Class. The aircraft has 16 seats in Business Class and 150 seats in Economy Class. The Economy Class is decked out in earthy brown tones. The single alley Economy Class cabin is configured in 3-3 abreast seating. I find the Economy Class cabin a tad cramp with the number of seating MH has cramped onto this aircraft. 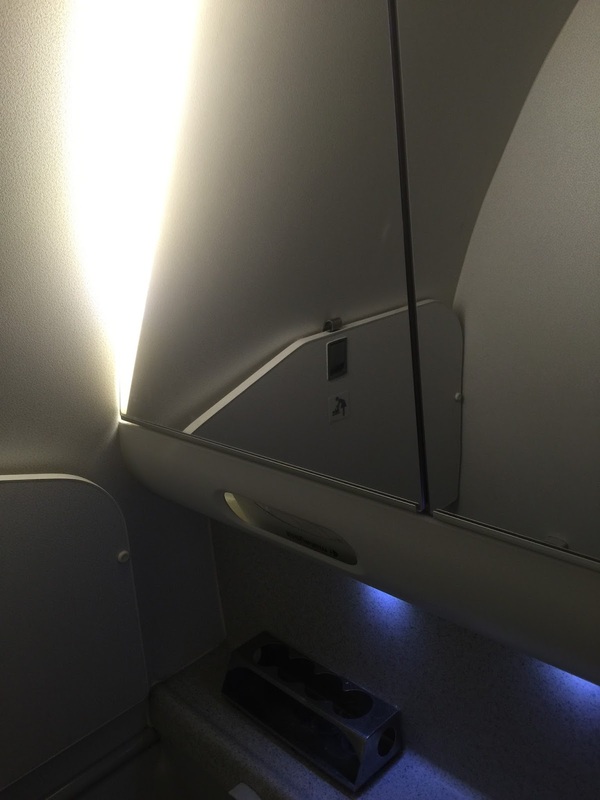 The bulkhead of the cabin features the Boeing Sky Interior lighting. There are only 2 lavatories in Economy Class situated to the rear of the aircraft. The lavatories felt a little cramp with little room for one to turn about too much. 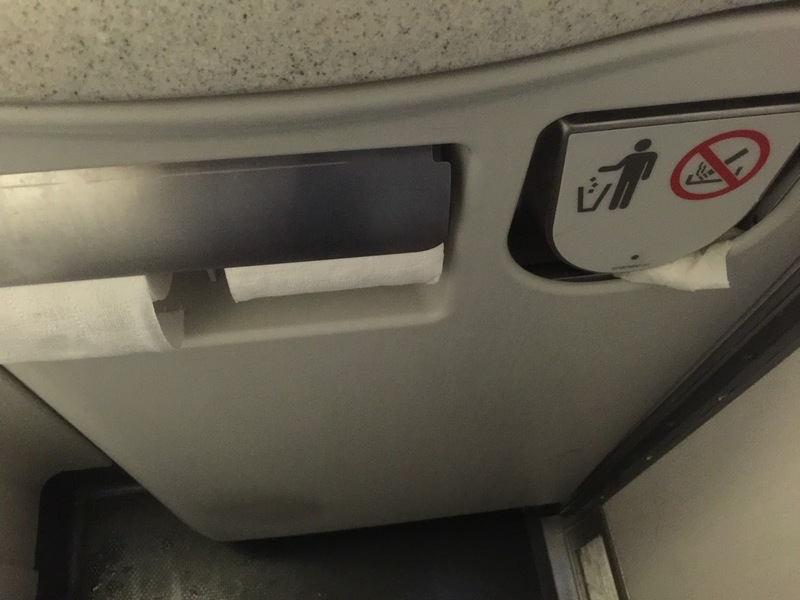 The amenities in the lavatory is limited only to hand soap, toilet paper and tissues. The opening of the trash bin in the lavatory is situated on the side of the sink instead of the usual top. Seats on MH is decked out in brown leather with fresh red headrest. The seats are comfortable enough for a short under 1 hour flight. As the flight is short, additional amenities such as pillows, blankets and headphones are not available. 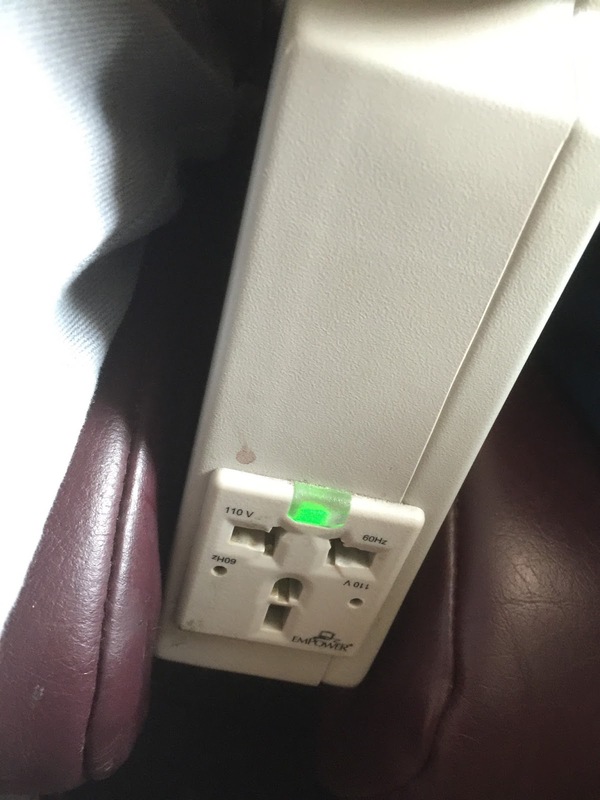 Each seat comes with a USB port on the seat in front. The seats have a single seat pocket, located on the back of the seat in front, where the aircraft information card and magazines are stored. I opted for 2 types of seats on both legs of my journey. Headphone jacks are located on the right armrest. For the SIN-KUL leg, I opted for row 14, which is the emergency seat. The seat on Economy Class measures 17″ in width and the seat pitch for the emergency exit seats measure a whopping 39″. It is so wide that I can stretch out my legs. The extra leg room is need for emergency purposes. 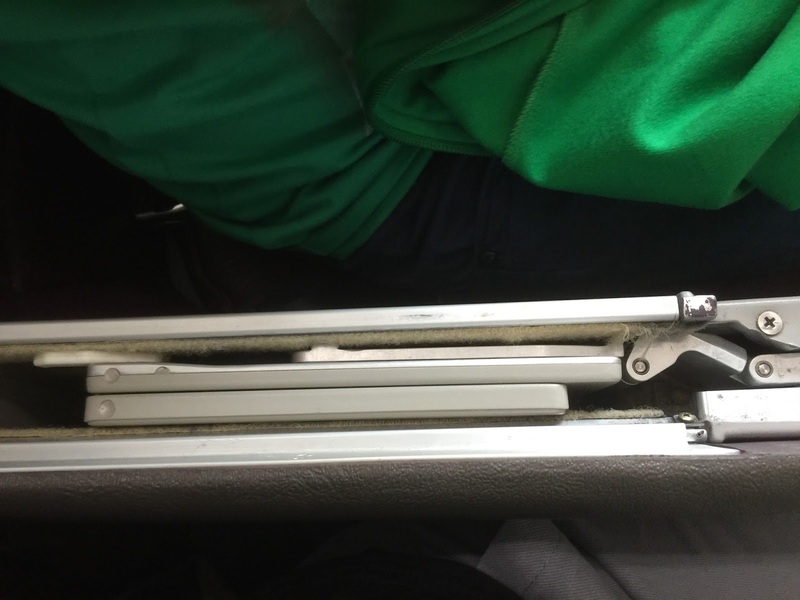 Due to the width pitch, the tray table in front of the seat is locked, instead additional tray tables are installed onto the armrest. 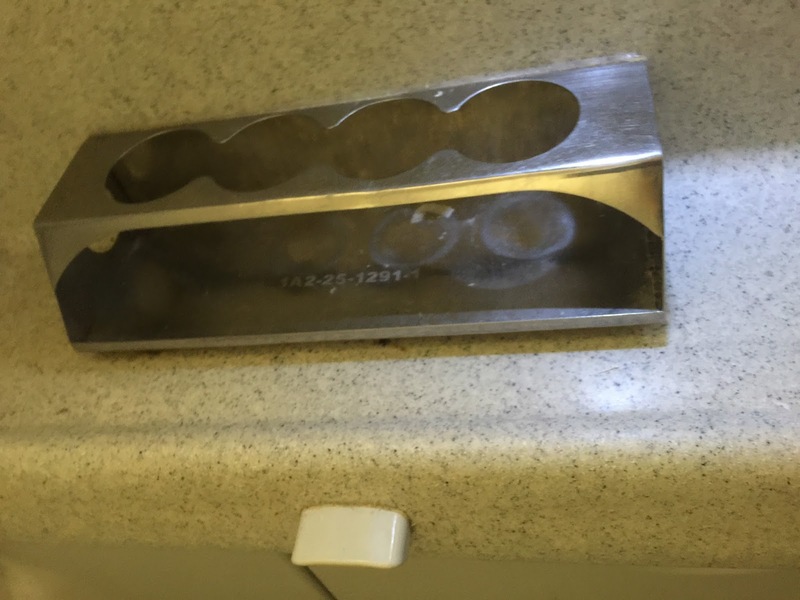 Due to the location of the tray table, the armrest are not movable. There is no recline for seats in this row. For the KUL-SIN leg, I got the “normal” Economy Class seats. The seat pitch measures 30″ which I find it quite alright, however for someone who is taller might find it to be a little cramp. The standard width of the seats measures 17″. As with the usual Economy Class seats, the tray table is stowed on the back of the seat in front. This seat is able to recline for about 5″ and the recline button is located on the inside of the arm rest. Each seat has an In-Flight Entertainment system, which plays movies/shows on demand even for a short flight. Each Economy Class seat has a large 9″ screen with responsive touch screen function. MH shows the latest movies such as Terminator Genisys, Inside Out to name a few. Passengers will be spoil for choices when it comes to the library in the IFE. I had to split Inside Out into 2 parts due to the short flight. As mentioned earlier, headphones are not provided for the SIN-KUL leg, to enjoy the IFE one is advised to bring along a set of headphones. The controller for the IFE is located on the back of the seat in front. Unlike some airlines, the IFE on MH is turned on the moment when I boarded the flight, hence I was able to start browsing through the movie options and watch movies in the midst of boarding once I settled on my seat. Meal service commenced shortly after the seat belt sign is turned off. Due to the short flight time, meal service can be challenging as the flight attendants have to pour the drinks in advance before serving to the passengers. However I do find the meal service onboard to be pathetic. Passengers were served with a small packet of peanuts and a glass of orange or apple juice. Perhaps due to the short flight, there is nothing much they can do. I think MH can learn from other airlines, which also operate short flights, by distributing snack boxes and packet drinks which were already being pre-packed in advance, all they need to do is just to distribute. I thought MH has rather good service. Prior to the flight, I contacted the call centre to change seats as the seat change options was not available when I did check-in on mobile app. Not knowing which button to press on the audio menu (there is no option for change of flight or seats), I was connected to an agent. I apologised to her for pressing the wrong option. Instead of brushing my request aside, the agent assured me that it is alright and she will help me change seats. She even explored the seating with me patiently and helped me secure the best seats for my flight. In the aircraft, due to the short flight time, the attendants were busy with preparing the peanuts and drinks to distribute to the passengers. There are very little time for them to engage the passengers. The only time is during boarding and deplaning. I do find the service (with the limited interaction time) to vary with who you met onboard. On the same flight, I got a (male) attendant who behaves like a diva, and another attendant who was always smiling when she go around doing her pre-flight checks. 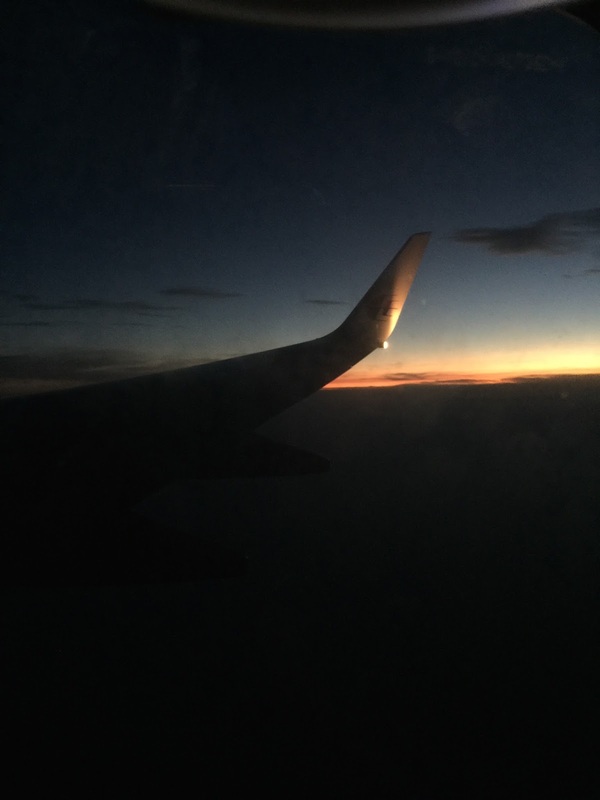 I engaged in a short chat while boarding with a stewardess in the KUL-SIN leg, despite flying the whole day (the attendants, as I understood from her, fly throughout the day shuttling between Singapore and Kuala Lumpur) she still kept her smile and asked how was my day. For a short flight, I found MH to be very comfortable. The availability of IFE for such a short flight is a plus. On top of that MH grants a generous 30kg of check-in baggage for those flying in Economy Class. Despite the pathetic peanuts served as meal, I thought MH is rather good. Service is great generally, with attendants welcoming passengers and bidding passengers farewell at the door. The flight and landing was a little rough, perhaps due to turbulence and the small aircraft. I would consider MH the next time even on longer flights.